KEY PHRASES: Infinite Space, The Void, Vacuum, Zero Point Energy, Virtual Manifold, V.E.M. as Psychotronic Machine, Virtual State Translator, the Physics of the Plenum, Post Quantum Physics, Synergetic Interaction, Imagineering, Orthorotational Geometry of Dimensions, Chaos and Complexity, Depth Psychology, Mind/Matter Interface, Nothing becomes Something. ABSTRACT: Nuclear engineer and researcher, Thomas E. Bearden has proposed a new approach to physics with some startling new theories based on Hugh Everett's many-worlds interpretation of quantum mechanics (1973). Bearden extends QM theory, rather than corrupting it. The main thrust of Bearden's work is toward explaining paranormal phenomena, the collective unconscious, weaponry, and other technological possibilities. His new view of physics (energy science) is grounded in what he calls scalar electromagnetics, from which he proposes deriving "free energy." This is, in essence, tapping the Vector Equilibrium Matrix for zero point energy. The key to his technological approach is to "let the EM force fields fight themselves to a 'cancellation,' forming a vector zero." Antigravity is just one possibility. Multiple realities contain all possibilities, but in enfolded or virtual states. This theory alleges that there are clustered worlds, which are three-dimensional to an observer within them, yet virtual to an observer from outside. These hyperspace dimensions are orthogonally rotated (90 degrees) in respect to one another. Selecting a frame, or cube of space, facilitates access. When we consider the vastness of space, we perceive emptiness due to our relative position in this universe. The Void is actually densely packed with virtual energy which awaits translation, or transduction into our observable 3-dimensional reality. These energies or entities appear as virtual because they are unobservable through ordinary means. Crosstalk across these channels is the basis for the collective unconscious, paranormal phenomena, and the manifestation of our material world. Like philosophy, physics is not any absolute description of Truth. Rather, both disciplines invite us to "Look at it this way." This approach is very much in line with the long-standing tradition of speculative Qabala and Hermetic philosophy. Thomas Bearden's theories bear directly on our investigation of the nature of Nuit and the vector equilibrium matrix. By commenting on the physical and philosophical qualities of the vacuum, and attempting to describe how nothing becomes something, Bearden has joined a host of philosophers, mystics, and scientists with an interest in the threshold of our observable universe, and what lies beyond. In EXCALIBER BRIEFING: EXPLAINING PARANORMAL PHENOMENA (1988), Bearden succinctly outlines his theory, as well as offering several real-time applications. In order to relate his ideas and those of Everett to our notions of the V.E.M., we shall have to draw heavily on his work. We ask the reader's patience with the necessary quotes, but we hope they will simplify the complexity of comprehending even the gross nature of the V.E.M. But before we review Bearden's ideas, we will discuss what state-of-the-art quantum cosmology has to say about the nature of reality. Long ago the Gnostics believed that the true unrevealed nature of the Void was a Plenum, or fullness. Modern quantum mechanics has physically verified this intuitive perception of reality. The vacuum of empty space is not empty. It contains energy (zero point energy) and entities (pure virtual particles). Both the energy field and empty space are in flux, and probably interface with other universes through wormholes (or tunnels). Sidney Coleman, a theoretical physicist from Harvard, has been investigating the nature of the vacuum and its relationship to the cosmological constant--zero. He, and other physicists can't decide whether the total energy in the vacuum should be positive or negative, but they agree that the energy ought to be huge. Coleman asserts "the cosmological constant is zeroed out by wormholes; invisible, submicroscopic rips in the fabric of space-time that tunnel out of our universe, linking it to an infinite web of other universes." What it says in this case is that the precision with which you can measure the energy of any system, such as a piece of empty space, is limited by the duration of the measurement; the shorter the time, the greater the imprecision. And this indeterminacy can never be resolved simply by more accurate measuring instruments; it is inherent in the system itself. Over a short enough time the system can assume just about any energy--and it does. In a world ruled by quantum mechanics, the energy of the system in any fleeting instant can be seen only as a wavelike function. As a consequence, the vacuum of empty space is not empty; it is pervaded by fluctuating fields of energy that, when large enough, manifest themselve as particles--individual photons, for example, or particle pairs consisting of an ordinary electron or quark and its anti-matter twin, which burst into existence and then annihilate. The vacuum is thick with these short-lived "virtual" particles. It looks empty only because each particle's visit to existence, according to the uncertainty principle, is so infinitesimally brief as to be undetectable. But the effects of these virtual particles en masse may be detectable. Virtual particles ought to have one effect in particular: their energy ought to warp space. The deformation would be entirely independent of that wrought by ordinary matter, and so, Einstein notwithstanding, it would constitute a nonzero cosmological constant. The cosmological constant is very nearly zero. The mechanism, according to Coleman, is similar to virtual particles in that it arises from quantum fluctuations. But this time the fluctuations aren't those of energy fields [zero point energy]; they are fluctuations of empty space itself [vector equilibrium fluctuations]. Stephen Hawking invented the quantum wormhole in 1988. Just as quantum mechanics says there is a certain probability that particles can appear from nowhere in a vacuum, quantum cosmology says there may be a certain probability that a small chunk of space and time will suddenly pop into existence. That is what a wormhole is--a fluctuation in the space-time field, just as a virtual particle is a fluctuation in an energy field. The wormhole could connect to any one of an endless number of preexisting parallel universes that are otherwise inaccessible to us. There is no reason to assume our universe is the only one; webs of parallel universes are equally possible. They can be imagined like balloons connected to one another by thin, rubbery necks of space-time--those are the wormholes. The regions inside and outside the balloons and wormholes are outside space-time. It doesn't exist. One meaningful consequence of wormholes is that they might contribute information to our universe in the form of values for the constants of nature. They might also fix the energy density of the vacuum--the cosmological constant. Somehow wormholes arrange things so that the value of the cosmological constant is zero--so that the huge virtual particle components cancel exactly. According to quantum cosmology, this is by far the most likely outcome. Zero point energy is the kinetic energy that remains in a substance when its temperature is absolute zero. The vacuum has zero point energy, also. Any potential is just a bunch of trapped dynamic vectors, hence trapped vector (translational) energy. It is translational energy that is locally trapped and not translating. The potential is thus like an accumulator or capacitor. It can be "charged up" and "discharged." The vacuum is increasingly being regarded as composed of an incredibly dense structure of virtual electromagnetic energy, even at zero degrees absolute. Superspace consists of pure massless charge flux, pure scalar waves. If compacted this energy density of the vacuum is enormous. Here, in the vacuum, spacetime is incredibly dense, and matter is etherically thin. Spacetime goes through matter, rather than matter through spacetime. And this energy density of the vacuum does interact with electromagnetic fields and matter to give observable effects, such as the Lamb shift. In his inflationary model of the hot Big Bang, Alan H. Guth considers matter to consist of scalar-field particles, (SCIENTIFIC AMERICAN, Dec. 1991). "Such field particles are not the stuff of everyday life, but they do arise naturally in many theories." The rapid expansion of the universe during inflation magnified these initially insignificant microscopic fluctuations, transforming them into macroscopic changes in density [ref. chaos theory and the pumping up of micro- to macro-scopic changes as one of the characteristics of chaos]. Inflation itself depends on a number of assumptions. For example, it would have occurred only if the scalar field began with a large, approximately constant energy density. This approximately constant energy density is equivalent, at least for a brief time, to Einstein's famous (or infamous) cosmological constant. Therefore, like it or not, the success of inflation rests on certain assumptions about initial conditions [another aspect of chaos theory]. What happened before inflation? How did the universe actually begin?" In the pre-inflation era, the size of the universe tends to zero, and the strength of the gravitational field and the energy density of matter tend to infinity. That is, the universe appears to have emerged from a singularity, a region of infinite curvature and energy density at which the known laws of physics break down. Near a singularity, space-time becomes highly curved; its volume shrinks to very small dimensions. Under such circumstances, one must appeal to the theory of the very small--that is, to quantum theory. In quantum mechanics, motion is not deterministic, but probabilistic. A quantity called the wave function encodes the probabilistic information about such variables as position, momentum and energy. For a single-point particle, one can regard the wave function as an oscillating field spread throughout physical space. Because of the uncertainty principle, the kinetic and potential energy of a system cannot both be exactly zero. Instead the system has a ground state in which the energy is as low as it can be. (Recall that in the inflationary universe, galaxies form from "ground-state fluctuations.") Such fluctuations also prevent the orbiting electron from crashing into the nucleus. The electrons have an orbit of minimum energy from which they cannot fall into the nucleus without violating the uncertainty principle. Though it is still considered an extravagant claim, the fundamental assertion of quantum cosmology is that quantum mechanics applies to the entire universe at all times and to everything in it. In a theory of the universe, of which the observer is a part, there should be no fundamental division between observer and observed. The wave function of the entire universe can't collapse each time an observation is made. In cosmology, there is only one system, which is measured only once. Hugh Everett III of Princeton (1930-1982) asserted that there exists a universal wave function describing both macroscopic observers and microscopic systems, with no fundamental division between them. A measurement is just an interaction between different parts of the entire universe, and the wave function should predict what one part of the system "sees" when it observes another. So, there is no collapse of the wave function, only a smooth evolution described by the Schrodinger wave equation for the entire system. But as he modeled the measurement process, Everett made a truly remarkable discovery: the measurement appears to cause the universe to "split" into sufficiently many copies of itself to take into account all possible outcomes of the measurement. This has been discounted by others into possible histories for the universe with assigned probabilities. For practical purposes, it does not matter if we think of all or just one them as actually happening. Certain regions, such as those close to classical singularities, exist in which no prediction is possible. There the notions of space and time quite simply do not exist. There is just a "quantum fuzz," still describable by known laws of quantum physics but not by classical laws. [It may be subject to the laws of quantum chaos]. Inflation is assumed as one of the quantum initial conditions. The inescapable task of the quantum cosmologist is to propose laws of initial or boundary conditions for the universe. Stephen Hawking's idea is called the no-boundary proposal, which admits many possible histories. Perhaps, the universe has tunneled from "nothing." The evolution described by inflation and the big bang would have subsequently occurred after tunneling. This is consistent with the Qabalistic explanation of the emanation of Kether from Ain, Ain Soph, and Ain Soph Aur--the veils of negative existence. The picture that emerges is of a universe with nonzero size and finite (rather than infinite) energy density appearing from a quantum fuzz. After quantum creation, the wave function assigns probabilities to different evolutionary paths, one of which includes the inflation postulated by Guth. Although some theorists disagree, both the no-boundary and tunneling proposals seem to predict the conditions necessary for inflation, thereby, eliminating the need for assumptions about the scalar-field matter that drove the rapid expansion. The no-boundary and tunneling proposals eliminate assumptions about the density perturbations. Although inflation explains their origin, the exact form and magnitude depend on certain assumptions about the initial state of the scalar-field matter. The inflation model assumes the inhomogenous parts started out in their quantum mechanical ground state--the lowest possible energy state consistent with the uncertainty principle. But Hawking's no-boundary proposal states that everything must be smooth and regular on the bottom cap of the space-time tube. The condition implies that inhomogeneous fluctuations must be zero there. The fluctuations enter real-time as small as they can be--as the quantum mechanical ground-state fluctuations demanded by the inflation model. The tunneling proposal makes the same prediction, for similar reasons. So, quantum cosmology alleges the universe appeared from a quantum fuzz, tunneling into existence and thereafter evolving classically. Quantum creation scenarios produce gravitational waves of a calculable form and magnitude. Gravitational waves interact very weakly with matter as they propagate through space-time. Therefore, when we observe them in the present universe, their spectrum may still contain the signature of quantum creation. But gravity waves are hard to detect, so quantum cosmology can't be verified conclusively to determine whether the no-boundary or tunneling proposals are the correct ones for the wave function of the universe. But, so far, these are the best guesses, and they do not contradict the Qabalistic notion. ENERGY SCIENCE AND SCALAR FIELDS How does Bearden's energy science relate to quantum cosmology, the vacuum, and vector equilibrium? Through scalars and scalar fields, the virtual vacuum plasma ("virtual particle vacuum ether"). A scalar is a vector characterized by magnitude and time. Scalar waves (virtual particle flux wave) in the virtual state massless charge flux (vacuum), do not breach the quantum level to become observable, yet they are real. They are oscillations of the stress energy tensor of the vacuum. In the vacuum state everything is disintegrated, but highly dynamic. The vacuum is not an emptiness FILLED with massless charge, rather, it IS identically massless charge (disintegrated dynamicism). It is a plenum, not an emptiness. It is also pure, undifferentiated action. Multiple vectors acting on one point and summing or multiplying to zero (Vector Equilibrium Matrix) are physically still present, even though their vector resultant is a zero vector...Thus physically a zero vector can be a system having a very real, distinct sub-structure of nonzero vector components. These infolded vector components may be highly dynamic (i.e. chaotic). The anenergy of each infolded dynamic vector component is thus "trapped" inside the local vector zero system. Anenergy is the stress energy of the vacuum. "Fragments" of energy, more subtle than electromagnetic energy, turned against themselves are locked into a vector zero summation. This is modeled as scalar, massless charge flux or virtual particle flux, or "pieces" of the spatiotemporal vacuum spacetime medium. These observable virtual anenergy particles are rotated more than 90 degrees from the laboratory space. Anenergy particles are the individual scalar wave components of vector electromagnetic waves. Anenergy components may be coupled into energy, which can be compacted into mass. Scalar fields exist for each point in space (Hadit) which infolds n-dimensional virtual state substructures. Each succeedingly higher dimension is a succeedingly lower level of a virtual state. THE VACUUM ITSELF IS SUCH A SCALAR FIELD. This massless charge field enfolds vast electrostatic scalar potential. Standing scalar waves can be coupled at exactly 180 degrees out of phase in a resonant cavity to create zero sums through scalar resonance. There is just such a resonant cavity in the brain, between the pituitary and pineal glands. These waves of potential co-modulate each other and "lock or zip together" as a zero-vector system wave. This allows for crosstalk or translation between dimensions. Dimensions have certain primary geometrical physical attributes, such as length, used to describe the separational relationships of physical phenomena. By geometrical we mean that the dimension is considered to "exist" in either the presence or absence of the observable physical phenomenon. However, by agreement the dimension of itself is not directly observable. Yet it can be inferred by measurement. Hyperchannels for crosstalk between dimensions are known as "magic windows". These interdimensional nodal points have a naturally tuned frequency of a good hyperchannel between orthogonal frames where scalar wave anenergies crosstalk readily. Crosstalk normally means the transfer of energy or signal from one channel to another, by cross modulation or cross coupling between the channels. In this new approach it refers to the virtual energy exchange between orthogonal universes or frames--that is, between different 3- or 4-dimensional slices of an infinite-dimensional universe. Magic windows are frequency dependent. Some magic windows are 38-40 kHz, 150-160 kHz, 1.1-1.3 MHz, 1.057 (Lamb shift), and in the near ultraviolet frequency. These frequencies represent enhanced channels between subquantal (virtual) and spatial (observable) states. A particularly good magic window exists when the infrared and ultraviolet bands being utilized are phase-locked so that the ultraviolet represents a first harmonic of the infrared. Also known as the Tesla wave, this standing scalar wave can be seen alternately as a time wave or a gravitational wave. It is a wave of pure potential. It is a longitudinal scalar potential wave in massless charge, in the vacuum charge flux itself, and in pure spacetime. Since there are no spinning charged mass particles, it does not form a vector electromagnetic wave, as conventional theory would predict. It breaks into shadowy, virtual vectors which are not integrated. Rigorously vector fields cannot exist in a vacuum, but can only exist on an observable mass. A "shadow" vector field can exist in a vacuum. In the absence of observable mass, it exists as small virtual vectors, each existing as a virtual particle in the vacuum. Such a "shadow" vector field may be regarded as two coupled scalar fields, where the coupling is performed by the virtual particle flux of which the vacuum itself consists. If this same holds true for the collective unconscious, it may be a physical analog for the unintegratable aspects of the archetypes in human personality. Resonating standing scalar waves in the brain may be the physical interface for archetypes. Since the vectors of vector equilibrium represent the paths of least resistance, they may represent preferred pathways in the brain, as suggested by the chronic reappearance of archetypal patterns. Classical brainwaves are only the residue or "spillage" waves of the brain. The important activity is in the specific patterning of the vector zero summations of the myriads of ion discharges. Every "discharge ion" constitutes a small EM force vector. The summation of these vectors is largely zeroed; however, the patterns formed by all these tiny components are not random. The intent and will of the human being is expressed in the changes in the patterning of these dynamic substructures. Present EM brain wave theory does not touch the basic "thought patterns," which are scalar in nature. Consciousness refers, among other things, to the intersecting stream of monocular, one-at-a-time virtual projections into the mind from the quantum changes of photon interactions upon the body sensors [to be explained more fully later]. Memory gives the entity the illusion of moving through time. In the absence of deeper understanding, the individual consciously sees itself as a separated physical object moving and changing in time with respect to other separated objects that it perceives. The "externality" of certain changes in the physical world is due to the lack of mental control or influence over them. "Internality" of certain other changes is due to the ability to mentally control or influence them. The ordinary conscious mind is a serial processor. Only one thing at a time is discriminated in its awareness. But the unconscious mind is totally conscious--but multiply so, since it is a parallel processor of many discriminations at once. The linear mind cannot directly perceive the individual discriminations of the parallel processor, since THESE APPEAR ONLY AS A BLUR OR NOTHINGNESS to it. This is the mechanism of the barrier between the conscious and unconscious minds. Projections from the unconscious onto the scenes of the conscious mind will thus appear symbolical--that is, having many hidden meanings at once. This is why our dreams, for example, appear to our conscious minds as weird and distorted, but highly symbolic in nature. The mind is a world composed of separation events (waves, operations, processes) in unseparated being. We may model it as a physical universe, three orthogonal turns away from the ordinary physical universe, and tuned slightly selectively to one physical organism's body processes. Eastern masters have always told us that all reality is mind-stuff. Now we can model that process. Mind anenergy is considered to be progressively collected, condensed, and kindled into denser substance and objects by rotation toward the ordinary physical world. Thus a piece of inert matter is simply condensed energy, which itself is condensed anenergy, which is condensed mind flux (crosstalk) from all minds [collective unconscious]. We may model the mind physically, or model the physical as mindstuff, eliminating the artificial dichotomy between mind and matter that presently is assumed in orthodox science. The VEM and Diamond Body are psychotronic generators for amplifying and translating mindstuff. They are devices for producing observable effects by collecting, condensing, amplifying, and/or processing subtle anenergies or scalar waves. Psychotronic devices are virtual state engineering devices that process and utilize scalar EM waves of massless charge flux. A photon is the basic action quantum. It may be considered as an oscillation in and outof time. It may also be considered as a virtual pattern of positron/electron pairs. It is a piece of electromagnetic radiation when it interacts as a particle. One half of the photon exists in and carries positive time (negative charge), and the other half exists in and carries negative time (positive charge). Thus, one half is "normal" and the other half is "time-reversed" (phase conjugated). The photon may be considered as one cycle of an electromagnetic wave. The photon is the basic carrier of time. It consists of a piece of energy welded to a piece of time, with no seam in the middle. The passage of "time" thus moves at the speed of light, its carrier. When its magnitude diminishes below the quantum threshold, a photon becomes a virtual photon, whose emission and absorption cause charge on an electron. Photon interaction is the absorption and emission of photons by particles or objects. The macroscopic world is created by this interaction, which is the basic quantum change interaction. Scalar waves are emitted and absorbed by the nuclei of atoms, passing right through the electron shells without interaction. When we introduce additional scalar interactions beyond the ambient background, the nuclei change appreciably, though this level of physical reality may be far from stable. This is the higher reality, and it is sensed by the scalar electromagnetic functioning of our nervous system. Unfortunately, this system outputs only to the deep unconscious, since it is highly multiocular. Thus our conscious mind, being monocular, does not perceive the most fundamental reality in which we exist. "Time" is the special dimension in which multiple objects can exist simultaneously in the same interval. Time is multiocular and space is monocular. Our conscious mind is fitted to the monocular photon interaction. Being monocular, our conscious mind cannot be aware of time directly. For that reason we do not "see" time consciously. We do "see" it, however, unconsciously. The true meaning of being "lost" is to be separated from the consciousness of the All, which is separation of our conscious, gross sensing from our finer, more subtle, and infinitely richer--and unconscious--scalar sensing of ultimate reality. Because the effect of photon emission is "carrying away time," it forms a filter between our senses and fundamental reality. This time-differentiation of fundamental reality, eliminates our ability to detect those things which occupy time but not normal 3-dimensional space--such as mind, thought, etc. Almost all our thoughts, concepts, words, and ideas are fitted to this partial reality--and this is the universal human problem and delusion. Einstein alleged that our language demands Cartesian coordinates, and thus limits our thinking. We see a spatial universe of separated spatial objects, while in actuality we exist in an undifferentiated single wholeness. The mindworld and the physical world (mind and matter) have in common the same time dimension. Dynamic movements in each result in small crosstalk being projected into the other world, a crosstalk so small as to be virtual and normally unmeasurable. The photon interaction invokes a time-differentiating operation, stripping away or suppressing the time dimension, resulting in a spatial reality or objective reality being perceived or observed. In the process it separates mind and body by destroying the only common connection or channel. The photon interaction is the agent that creates objectivity itself. The photon interaction separates spacetime into space and time exclusively. An object, being something which occupies space, is thus timeless. Objects do not exist in time, because the union of an object with time constitutes spacetime, which cannot be perceived, detected, or observed. Only changes in (derivations of) spacetime can be perceived, detected, or observed, but not spacetime itself. That with which light has not interacted is not objective. The concept of mass is not a function of time, but only a function of space. It is thus three-dimensional. The photon is also three-dimensional, but one of its dimensions is the time dimension. When the photon strikes the mass and is absorbed, one portion is turned into mass by orthorotating one turn. Its compound nucleus of spacetime is not perceivable. When a photon is re-emitted, it may or may not be of the same frequency and energy as the previously absorbed photon, depending on the absence or presence of any other perturbations. A small bit of spatial mass is orthorotated which turns the bit of mass into a small piece of energy. In the rotation a small piece of time is bitten off and yields a quantum of action, which now constitutes a photon. Photon emission thus strips away the time dimension, leaving a spatial object. EINSTEIN POINTED OUT THAT THE VELOCITY OF AN OBJECT MAY BE VISUALIZED AS ROTATION OF AN OBJECT IN HIGHER DIMENSIONAL SPACE. VISUALIZED AS SPATIAL ROTATION RATHER THAN ROTATION TOWARD THE TIME AXIS, THE VELOCITY OF LIGHT IN A VACUUM MERELY CONSTITUTES THE ROTATION OF A PIECE OF MASS BY AN ANGLE OF 90 DEGREES TO THE LINE OF MOTION, IN THE LAB SPACE IN WHICH WE VISUALIZE THE PHOTON (THE ROTATED PIECE OF MASS) AS MOVING. The spacetime compound nucleus has now once again been separated into spatial and time components. Time is moving with the photon. And that is why time moves or flows at c, the speed of light in a vacuum. Time is carried only by the photon and photon interaction with an object produces that object's march through time. We perceive stability within change because we cannot detect, perceive, or observe the compound nucleus of spacetime in the middle. Thus we experience change as a thing becoming something else, but still being the same thing. VIRTUAL REALITY CHECK: VIRTUAL (STATE): that part of physical reality consisting of changes (particles, waves, and other entities) smaller than the least detectable (quantum) change. Disintegrated changes. A thought or thoughtform is also virtual. May be visualized as consisting of real, dynamic "pieces of vacuum" or "pieces of nothing"... Every ordinary observable particle (photon, neutron, electron, proton, etc.) contains or consists of a dynamically changing cloud of virtual objects. Exchange of virtual objects is thought to generate almost all forces of nature...The mind may be considered a special virtual universe, and thought a virtual object. Virtual states consist of multiply nested levels, each level progressively finer and more subtle. These sublevels also correspond mathematically to higher geometrical dimensions. EXCALIBUR BRIEFING THE BODY ELECTRIC Our understanding of the processes which go on below the quantum level adds another nuance to our metaphysical concepts of the "subtle body", the relationship of mind and matter, and the relative nature of reality. Whatever we find out about the nature of this realm, and its relationship to mass, applies to our own bodies and minds as well. We are one and the same as the structures that underlie the matter and energy of our gross structure. That structure is continuous, interconnected, and non-local in nature. We have, enfolded within our being, an underlying reality even more fundamental than the structure behind the interconnected wave patterns described by quantum mechanics. This massless counterpoint to our being has its basis in non-being. To conceive of its nature, we must penetrate not only into the Void, but beyond--through the looking glass into a dimension where chaos is the norm. Whatever this world is, we are that! You share the same anatomy as the Star Goddess. The elements of your body were cooked in the crucible of some long-exploded supernova. This very ephemeral virtual ether translates itself into matter by turning and turning on its gyres, transforming itself from no-thing into something. We perceive its real-time effect as electricity, without really comprehending what that energy is. "It is well known that all mass is charged; thus everything in one sense is electricity. To examine this concept, let us look again at the electron with its virtual photons being emitted and absorbed, which virtual activity creates the electric field of the electron." According to Bearden, the electric field constitutes a steady activity of the emission and absorption of virtual photons. The electron spin is more of an implosion or explosion in higher dimensional space. Spin is occurring in at least four spatial dimensions, not just three. It is more of an implosion or explosion into and out of this three-space universe frame. We might visualize the implosive or explosive spin as similar to vector flux. Two like-charged particles with precisely antiparallel spin run right through each other when they meet, with no interaction at all, electrical or otherwise. This successful experiment at Argonne National Laboratory disproved the old idea of concrete, solid, material reality. Yet, once again, we are that! In the middle of being is non-being. Before we leave the descriptions of the sub-quantal electrical activity of the body, we can examine some of the implications of bioelectromagnetism. The most prominent researcher in this area is Robert O. Becker. Becker is famous for his research on applying electrical fields to the body for healing and tissue regeneration. But he has also done experiments relating the application of electromagnetic currents to the brain and results on consciousness. Some of the most interesting are recounted in THE BODY ELECTRIC, co-authored with Gary Selden (1985). We also found we could work backward, using the [DC] currents to produce anesthesia. A strong enough magnetic field oriented at RIGHT ANGLES [orthogonal] to a current magnetically "clamped" it, stopping the flow. By placing frogs and salamanders between the poles of an electromagnet so that the back-to-front current in their heads was perpendicular to the magnetic lines of force, we could anesthetize the animals just as well as we could with chemicals, and EEG recordings of magnetic and chemical anesthesia were identical. We got the same effect by passing a current through the brain from front to back, canceling out the normal current of waking consciousness, as in electrosleep. Becker's further comments bear on the mind/body interface, and give a physiological mechanism for hypnosis. It tangibly demonstrates "mind over matter." He recounts his physical findings from hypnotized subjects. In each case, I found that the frontal negative potential of the head became less negative, often reaching ZERO, as the client attained deep trance. The reading changed in the same direction as in anesthesia, only not as far. Then, when the suggestion for pain control was given, the arm potential reversed just as it had in response to procaine. Conversely, when a control subject was asked in normal waking consciousness to concentrate forcefully on one arm, its sensitivity to pain increased, and the hand potential became more negative. We found we could use this difference to determine whether a person was really hypnotized or just cooperating. Some doubters (including myself, I'm afraid) had believed hypnoanalgesia was merely a state in which the patient still felt the pain but didn't respond to it, but these experiments proved it was a real blockage of pain perception. It seems that the brain can shut off pain by altering the direct-current potentials in the rest of the body "AT WILL." There's every reason to suppose that pain control through biofeedback or yoga likewise works by using an innate circuit for attenuating the pain signal, which releases a shot of the body's own pain-killers. When the signal is appropriately modulated, it releases endorphins (internally produced opiates)...I predict that research on this system will eventually let us learn to control pain, healing, and growth with our minds alone, substantially reducing the need for physicians. ...We know, on the psychological level, that a person's emotions affect the efficiency of healing and the level of pain, and there's every reason to believe that emotions, on the physiological level, have their effect by modulating the current that directly cantrols pain and healing. EM FIELDS, ACTION, CREATION, and TIME Every physical change of a charged particle (from proton to neutron to electron) constitutes a modulation imposed upon its virtual photonic activity creating its electromagnetic field. These modulations collect, become coherent, and breach the threshold of the virtual dimension. It, in turn, amplifies the signal or information, passing to the frame of the electromagnetic field. The EM field plays an integral role in coupling the virtual state reality to observable state reality. Action, according to physics, is the fundamental constituent of physical reality. In metaphysics, action is the agent of karma, producing natural consequences. Action is non-observable; only changes in action are observed, and then only partially. The photon is the basic quantum of action, uniting energy and time. All physical things are composed of rates of changes in action. These action changes are totally internal to the mass itself. Therefore, literally, the physical universe exists inside each and every part of itself, and is a giant hologram. An ordinary photon has a certain size that is quite fixed, and it is made of the substance "action" which is totally nonperceivable and nonobservable. Only changes in action are perceivable, observable, or detectable, never fundamental action itself. So physics already prescribes a universe made out of action, and that universe has no length, no time, no energy, no space, no concrete existence. Yet from it can be taken--by differentiation (which is simply separation)--any length, any time, any energy. However, only a single quantum at a time changes or is separated. Quanta do not superpose. At its most fundamental level, the entire universe is continually being created and then destroyed in sequence. The continual creation of a tiny piece of time and then the destruction of the piece of time makes us experience reality or change as if we were a pointer moving along a time line. We cannot see time because it is continually being destroyed by the change process, the very process of physical detection or observation itself. This is similar to the annihilation of a photon when it hits the retina and becomes absorbed. Now, if we invoke another kind of change, a virtual change, such that its size is always smaller than the actual quantum's size, then this kind of change cannot be detected, even theoretically. The concept of a virtual change is one such that the quantity of action that was changed was deliberately made smaller than the size required to throw the switch of detectable or observable change. It is an infinitesimally small perturbation. Individually, virtual photons cannot breach the threshold of quantum change, and so cannot be observed or detected. But in concert, they do breach the threshold. The totally unobservable, undetectable virtual photons being emitted and absorbed are conceived as creating the electric field at the same time as observable physical change (ordinary quantum change) occurs. The electric field, of course, can cause or induce change of sufficient magnitude to breach the quantum threshold and result in observable change. The bottom line is this: the virtual state can be collated and collected to sufficient magnitude to breach the quantum threshold and induce ordinary observable physical change. The electromagnetic field already does precisely this! We can coherently collect the virtual state to produce matter or its anti-matter, which after all are nothing but macroscopic assemblages of quantum changes, and we can thus get free energy, materialization and dematerialization, teleportation, and antigravity by means of special modifications and development of electromagnetic circuits. Each photon carries a small piece of time. And the entire virtual state reality is hanging onto that small piece of time as a modulation. That is where the probabilities are riding, in terms of the ordinary monocular interpretation of quantum mechanics. All the probabilities and possibilities are concretely real and occupy orthogonal universes. Since they all share the same single time dimension, there is a TIME BRIDGE OR TIME CHANNEL [QM wormholes] connecting the universes. Each move or change in one of them crosstalks a tiny bit into each of the others. Since it is the photon which carries them, then each photon contains all possibilities and virtual states modulated upon itself. Photon interaction thus involves the communication of these possibilities and virtual states to the object with which the interaction occurs. The virtual state psychotronic modulations of the mass's electric field are now riding on the virtual photons that generate that field. Every possibility concretely exists in that manner, in the virtual state, timewise hanging into the time dimension of the detected physical world's four-space frame, but spacewise hanging out of the ordinary three-space physical universe of objects. So indeed all possible realities, even the wildest and the most farfetched exist in the virtual state. THE TIME CHANNEL IS QUITE LITERALLY THE PARANORMAL CHANNEL THAT CONNECTS THE NORMAL SPATIAL WORLD TO AN INFINITY OF NON-NORMAL SPATIAL WORLDFRAMES. Only by the continual destruction of each piece of created time (by fusing it back together with the piece of energy involved, and forming a quantum which is unperceivable) are we able to experience physical reality at all, uncluttered and relatively free from the vast hordes of infinite realities through which the ship of quantum-change physical reality sails. Since the electromagnetic field represents a collection of this vast array of realities, then by proper selection (i.e., by coherent tuning) of multiple stages we should be able to select a particular virtual reality channel. And indeed so we can. Any scheme for drastically increasing signal-to-noise ratios should be adaptable to such a collection mechanism for the detection of bioenergy. "No earthly mind can enter." For sixty years I've heard your sort announce. Being all things at once. Follow me now into a much deeper level than ordinary thought, down into the atomic realm, the subatomic realm, and yes, the sub-quantum realm--deeper than the Void, into the lookinglass universe. Theoretical physicsts are used to visualizing a world which is removed from tangible objects by two levels of abstraction. From tangible atoms we move by one level of abstraction to invisible fields and particles. A second level of abstraction takes us from field and particles to the symmetry-groups by which fields and particles are related. The introduction of superstring theory has stretched scientific minds even further. Superstring theory takes us beyond symmetry-groups to two further levels of abstractions. The third level of abstraction is the interpretations of symmetry-groups in terms of states in ten-dimensional space-time (sound Qabalistic?). The fourth level is the world of the superstring by whose dynamical behavior the states are defined. Mystery. So, come...into the Mystic. The following is paraphrased, quoted, or synopsized from EXCALIBUR BRIEFING: EXPLAINING PARANORMAL PHENOMENA (1988, Strawberry Hill Press) by Thomas E. Bearden, who is a retired Lt. Colonel (U.S. Army). It has been condensed and juggled to accentuate its relationship to Buckminster Fuller's description of the Vector Equilibrium Matrix, a zero vector system. We hope to use this new approach to quantum physics to further reveal the psychotronic properties of the Diamond Body and the Synergetic Qabala. We also hope to relate it to Theoretical Qabala and consciousness studies. To simplify this theory for the reader we have eliminated the equations. See the book for the mathematical proofs. This, and other books by Bearden on paranormal phenomena and weird science can be ordered directly from Tesla Book Company, P.O. Box 1649, Greenville, Texas 75401. THOMAS BEARDEN'S SCALAR ELECTROMAGNETICS Let us use as a definition of reality: reality is that which can be conceptually and mathematically modeled and fitted to the phenomena existing in one or more minds. Physical reality is that which can be modeled and fitted to the phenomena in one mind. Mental and physical realities comprise "normal" reality. Complex or "paranormal" reality is that which can be conceptually and math-matically modeled and fitted to phenomena which exist in more than one mind, but not in all minds. From pure nothing--empty vacuum, absence of thing--one can generate everything, the presence of thing. Here is direct proof that ultimately opposites are identical. [There is] identity of opposites on their common boundary. Thomas E. Beardon, Nuclear Engineer The conventional interpretation of relativity considers only a single observer at a time (monocular). Change as seen by multiple simultaneous observers (multiocular) leads to an infinite dimensional, multiworld or multiuniverse similar to that postulated by Hugh Everett (1973). In the many-worlds interpretation of quantum mechanics essentially all possibilities exist and are. Each world splits into multiple possibilities after each and every event. Though consistent with the entire experimental basis of quantum physics today, this is a reality where all possibilities are physically real in their own dimension, though virtual entities to an observer in another dimension. Physical reality is not absolute. This can be shown experimentally. Two colliding protons pass right through each other in total violation of all physical rules, if their spins are exactly parallel. [In vector equilibrium, waves pass through waves without interference]. Protons are the central building blocks of all matter, the fundamental constituents of everything solid and concrete. Yet, they go right through one another, without any effect whatsoever when their spins are aligned properly, simply cancelling physical reality. There is no independent existence to mental phenomena; there is a perception operation involved when we think. There is no independent existence to physical phenomena; there is a perception operation involved when we observe physical phenomena. Furthermore, it takes a finite piece of time for the perception process to occur. At the boundary of exact opposites, all that is necessary to identify opposites is to lose all perceptual distinction between them. And that is accomplished by multiocular perception--perceiving the presence of both at once unseparated, hence the absence of either exclusively present. NOTHING SIMPLY CONSISTS OF THE PRESENCE OF THE TOTALITY OF ALL OPPOSITES. It is a contemporary form of the alchemical union of the opposites, or the psychological notion of "holding the tension of the opposites." But, separate time intervals are required for finite monocular perceptions. The laws of logic are simply the laws of the operation of perception--nothing more, nothing less. The ordinary laws of logic apply only away from a boundary. The boundary, threshold, or liminal area invokes the law of paradox. Identifying opposites simply consists of "packing together" two previously separated perceptions into a single third unseparated perception. Every single perceived thing has a boundary, where it both begins and ends its exclusive presence in perception output. In any perception ordinary logic and paradox are applied. Ordinary logic is explicit and paradox implicit, or conversely ordinary logic is implicit and paradox explicit. NEW DEFINITION OF ZERO To a monocular perception process, multiple presence constitutes absence of the exclusive presence of any particular one. Therefore such a multiple presence is monocularly unperceivable, and hence becomes a zero to a monocular detection process. This allows new definitions of zero, and a solution to the problem of nothing. Consider that a monocular detection process asks the question, "Is there a single exclusive thing present in my input?" If the answer is yes, an output is generated and perception occurs. If the answer is no, no output is generated and perception does not occur. The answer "no" occurs in two fashions: either total absence, or presence of two or more simultaneously. For either of these cases, monocular perception gives no output, and perception does not occur, i.e., the absence of perception occurs. Now note that the monocular perception cannot tell any difference in the two input conditions. To it, there is no distinction between the two conditions. The lack of any difference at all constitutes identity. Thus to a monocular perception process, condition one is identical to condition two when they are infolded together in condition three. So, TOTAL ABSENCE AND MULTIPLE, UNSEPARATED PRESENCE ARE IDENTICAL INSOFAR AS A MONOCULAR DETECTION PROCESS IS CONCERNED. Einstein's postulates of special relativity conclude that "every photon is moving at the same speed relative to every particle" in the laboratory frame of reference. The laboratory frame is the static reference frame of the observer/measurement. But higher dimensions (unobservable) may be enfolded in hyperspace and orthogonally rotated (90 degrees) to the laboratory frame. The Cube of Space, Diamond Body, and Vector Equilibrium Matrix are such hyperdimensional frames of reference. They allow us to conceptualize and engineer such realms. A frame of reference is a spatial, organized, measured lattice placed in emptiness (space, spacetime). Normally this refers to a 3-dimensional, spatial frame. All objects and points in the "universe" or spatial frame are considered to simultaneously coexist at separate, measured points in the frame. It differs from the vacuum in that, rigorously, vacuum has no existing definite lengths (vectors) and no existing definite time intervals (scalars). These appear only after measurements/detection, and are relative to the observer and to the detection process. A separate reference frame may be assumed to exist for any fixed or moving object, or entered on any point in another frame. When a type of frame is assumed, the entire class of physical interactions that can occur has been restricted to an assumed set or type. In other words, given the frame, the physics have been assumed. One of the greatest restrictions of an assumed "frame" is to rule out the consideration (existence) of other higher dimensions. In the new theory, higher dimensions are permitted and an orthogonally rotated frame can be equated to a field and vice versa. Hyperdimension, hyperspace, hyperframe, hyperworld, and hyperfield are all synonymous terms. ANY KIND OF FIELD CAN BE TURNED INTO ANY OTHER KIND OF FIELD, MERELY BY CORRECT AND PRECISE TIME SYNCHRONIZATION. Mass is determined by the resistance an object poses to an accelerating or disturbing force. Mass is also tied to three-dimensional objects. A photon, moving at the speed of light, can neither be speeded up nor slowed down; hence in one sense it exhibits infinite mass, but it loses a dimension when it intersects the laboratory frame. Due to orthogonality it appears two-dimensional with zero mass. This is because at the boundary opposites are identified. At the orthogonal boundary of three-space, zero mass and infinite mass become identical, so the photon exhibits both zero mass and infinite mass simultaneously when it crosses the threshold of the mass exhibiting world. The Diamond Body and VEM are manifolds of enfolded in-form-ation. The relationship between mind and matter is not mutually exclusive. The VEM is a means of engineering the transition from virtual to physical space, from concept to reality. Mind and matter are either partially or totally one and the same thing. They are of exactly the same nature, but only partially intersecting. Mind is an entire physical world, but it only minutely intersects this physical frame, and then only in a portion of this physical plane. The single dimension parameter generates the second, third, fourth, fifth, and up to Nth dimensions of the manifold, by repetitive operations on itself. PRIMITIVE PERCEPTION The primitive observer or "natural man" is conditioned to perceive objects and relations between objects. This is the basis of logic, mathematics, and physics. Set theory is simply the synthesized and abstracted game of elementary perception of the macroscopic world. This is why mathematics can be used to perceive physical phenomena. This macroscopic, intuitive perception is the basis of our concept of objectivity, and of our physical concepts of "observed" and "observable." What we see as an object has interacted with photons of light through absorption and emission. Light itself is only detectable in its interaction with matter. The concepts of object, mass, three-dimensions, and observation are directly correlated to the photon-mass interaction, and ultimately to the photon-electron interaction occurring in the human retina. The ideas of boundary, surface, and change in primitive perception thus involve two contradictory and simultaneously mixed interactions, absorption and emission. Because they are constantly intermingled, primitive perception cannot separate the two. Thus the primitive concept of a boundary consists of a simultaneous duality. Here the object both begins and ends. Here opposites are identified. The dimensionality and orthogonality (spatially) of the primitive perception process are also interesting. Photon absorption constitutes spatial integration for the photon: one additional dimension is gained by the two-dimensional light wave turning itself into the three-dimensional mass state. The photon also adds its piece of time to the absorbing mass, converting the mass particle to mass time or space time--adding the fourth dimension. Photon emission constitutes spatial differentiation, dimensionally speaking. One spatial dimension is lost by a little hunk of three-dimensional mass turning itself into a two-dimensional wave. Going from outside the object toward the inside (to track with photon absorption), the boundary marks the end of the two-dimensional wave region, so the object (or, more precisely, the interaction region) is spatially two-dimensional on the outside, and spatially three-dimensional on the inside. [So is the Vector Equilibrium Matrix and the Tree of Life]. It also occupies the time dimension on the inside, but not on the outside. [Ditto]. This directly accounts for a difference in the spacetime inside and spacetime outside, and is why mass may be regarded as a curvature or change in spacetime. Going from inside the object toward the outside, the boundary marks the end of the spatially three-dimensional region and the beginning of the spatially two-dimensional region. So the object is now spatially three-dimensional on the inside, spatially two-dimensional on the outside. The inside now does not occupy the time dimension, while the photon emitted outside does. So on the boundary, one spatial dimension is gained going in, and one spatial dimension is lost going out. Time is gained going in and lost going out, by the mass absorber-emitter. Gain or loss of a dimension is accomplished only by orthogonal rotation between 90 degree nested spatial frames. The photon interaction may be modeled as orthorotation of an entity spatially in a five-space. Einstein showed that velocity can be regarded simply as the measure of rotation of an entity in a higher dimensional space. Sincelight is orthogonal to the entire space, the speed of light is the same to every observer in that space. Velocity also represents a statement of the switching of time into length, and length into time. It is therefore a rotation of the spatial three-dimensional frame. The photon interaction process is monocular. Each photon must attack matter individually, and live or die in the process. Each photon born from matter is also born independently. Thus the primitive observation process is monocular, since it is totally in one-to-one correspondence with photon interaction that is monocular. Thus the observed world is monocular, quantized, discreteized. This why quantum mechanics seems so irrational and counterintuitive. It is difficult to comprehend that which cannot be verified by our senses and experience. But, macroscopic (observable) causality may be violated by control of hidden subquantal (virtual state) variables. Everett's theory of the universal wave function incorporates multiple simultaneous observation, and hence direct insight beyond the limitations of the monocular correspondence to the photon interaction. Photon interaction must be excluded whenever the so-called quantum effect is exhibited. If photon interaction is invoked, classical reality emerges. Photon interaction creates classical objectivity. Photon interaction is a time-differentiating operator imposed on four-space. Since light carries time, photon emission from an entity strips away the time dimension converting it to a spatial object. The time portion of an entity can interact with any number of time portions of other four-law entities if the time aspects of all of them coincide. To the laboratory observer, orthorotation constitutes pure dimensional integration and dimensional differentiation, and constitutes or creates an object in the first place as three-dimensional reality. OUTSIDE THIS PRIMITIVE PROCESS ALL EXISTS IN THE OMEGA NOTHINGNESS VOID, WITHOUT FRAME OR FORM. Ultimate reality (specifically, action) is dimensionless in the objective sense: for the objective sense exists only after an operation has been imposed. A quantum itself is lengthless (and has no exclusive energy, time, or momentum) until differentiation is imposed upon it. Fission and fusion of action quanta involve orthogonal rotation between orthogonal three-spaces sharing the same fourth dimension (time) in common. When a quantum is observed as manifest it exhibits changes in length, time, energy, mass, and momentum. It can be modeled as a vector. A vector is a mathematical entity which can be characterized by a magnitude and direction. They are formed by a difference in potential between two spatial points. Thus inductance and capacitance are merely (electromagnetic) vector statements of amounts of rotation, one in a positive direction and the other in a negative direction, toward an orthogonal axis in higher dimensional space. Vectors are characteristic of particle motion, and do not observably exist in the absence of a particle. IN THE VACUUM, ONLY AN UNZIPPED (DISINTEGRATED) VECTOR PATTERN EXISTS, ONLY THE POTENTIAL FOR A FORCE VECTOR EXISTS THERE. The vector field is the assigning of a magnitude and direction (vector) to each point in space. [Reference the Isotropic Vector Matrix]. The entire set of vectors and their spatial points is called a vector field. In Bearden's approach, such a vector field cannot observably exist in a vacuum, since only disintegrated things exist there. There each potential vector patterns exists broken into virtual bits, ordered in line to form the bits of the observable vector but not joined. In the presence of a detecting/integrating mass, such as a spinning charged electron the virtual bits and the spinning charged mass couple into a system that identically comprises the observable vector. In other words, the spin of an observable particle simply integrates the ordered virtual bit pattern, just as an old spinning wheel twists and integrates individual fibers into a stranded thread or rope. VIRTUAL (HIDDEN OR OCCULT) ENTITIES All fundamental particles--photons, neutrons, protons, electrons, etc.--exhibit the same behavior. So things, nothings if you will, can be processed in the multiplistic two-states-identified-as-one-so-no-single-exclusive state (paradox, boundary, threshold), as virtual and unobserved entities. From ordinary, objective lab space nothing is processed, and indeed nothing is there, because these virtual hidden-variable nonthings are unobservable. Yet, this processable, structurable, nonobjective reality exists outside objective, three-law spacetime and is the basis for all psychotronic phenomena. To our present monocular detection devices and monocular theory, such multiple-state entities are unobserved and hence are zeroes. They are pure vacuum, pure space, pure nothing, pure emptiness. But they are very real indeed, and they do physically exist, but multiocularly rather than monocularly. The virtual state is that part of physical reality consisting of changes (particles, waves, and other entities) smaller than the least detectable (quantum) change. Disintegrated changes. A thought or thoughtform is also virtual. Virtual entities may be visualized as consisting of real, dynamic "pieces of vacuum" or "pieces of nothing"--called quitons by Bearden. Every ordinary observable particle (photon, neutron, electron, proton, etc.) contains or consists of a dynamically changing cloud of virtual objects. Exchange of virtual objects is thought to generate almost all forces of nature. Conservation of energy need not be conserved in virtual interactions, and generally is not. In the new approach, the mind may be considered a special virtual universe, and a thought a virtual object. The virtual state consists of multiply nested levels, each level progressively finer and more subtle. THESE SUBLEVELS ALSO CORRESPOND MATHEMATICALLY TO HIGHER GEOMETRICAL DIMENSIONS. Virtual particles in the vacuum flux arise out of nothing spontaneously (creation) and disappear into nothing spontaneously (annihilation). Since this is random, at any instant any sort of pattern imaginable is "just appearing" and "just disappearing" in the vacuum. Thus a ghost-pattern of everything exists in the vacuum at any point or region, at any time. THE VACUUM IS THUS A GIANT VIRTUAL-STATE HOLOGRAM. INTEGRATING (KINDLING) ONE OF THESE FORMS WILL RESULT IN IT BECOMING FIRST A NEUTRINIC PATTERN, THEN A PHOTONIC (LIGHT) PATTERN, THEN A MATERIALIZING PATTERN, AND FINALLY A MATERIAL PATTERN. Discharge of the "potential" of this pattern then reverses the process. These two processes--charge-up and discharge--constitute materialization and dematerialization. Anything at all--living or dead--can be materialized or dematerialized. The vacuum, as scalar field, is also the rigorous identity of a massless charged field, of--for example--the electrostatic scalar potential, 0. Also, the scalar field is considered to be composed of two time fields: one in positive time and one in negative time that is the phase conjugate replica of the first. Thus the timeless, lengthless vacuum exists both in positive and negative time, and its potentials are scalar potentials. When the vacuum is uncurved, equal amounts and components of positive and negative time exist. When it is curved at a point, the positive and negative time components are unbalanced at that point. VIRTUAL HYPERSPACE Zero is a relative term--relative to an observer. An observer who perceives nothing, registers nothing--but subtle reality can be quite different. An observer sees his own frame, and intersections in that frame, nothing else. He does not necessarily see the entire reality of any object, and if an object is in a frame that does not intersect the observer's frame, the observer cannot detect that object at all. Photons behave like massless particles. A photon has zero mass because it is a two-dimensional object and only three-dimensional objects have mass. A photon also has an infinite mass because it cannot be accelerated along its direction of travel, i.e. go faster than the speed of light. A photon is a perfectly ordinary three-dimensional particle existing in a normal three-space that is one orthogonal turn away from the laboratory three-space. Localized mass is merely the result of orthorotational flux in and out of that localized space. This flux does not move through laboratory three-space, but rotates into and out of it, at and for each fundamental particle of mass in real-time three-space. This hyperspatial flux is actually flowing or rotating in hyperspace. This is where the ordinary spin of a fundamental particle comes from. Hyperspace flux lines are jittered because of modulations made by higher-frequency components. This jitterbugging, as Fuller calls it, relates to paranormal phenomena. We can look at hyperspace flux from the point of view of matter or mind. Materially it is a continual direct coherent collection of virtual subquanta to reach the quantum threshold, breach it and become observable quantum change. Virtual photons kindle and create electric fields and the charge of an electrically charged particle. From the point of view of our consciousness, hyperspace flux is a continual direct coherent collection of mind virtual state subquanta to reach the quantum threshold, breach it, and turn into observable quantum change (physical phenomena). THUS ALL MATTER IS TOTALLY MIND AND ALIVE--INERT MATTER IS JUST NONPREFERENTIALLY ALIVE. The resultant flux vector in an inert mass is ZERO since there exists as much flow out as in, and vice versa. THUS, WE ELIMINATE THE CLASSICAL DICHOTOMY BETWEEN MIND AND MATTER. Channels of least resistance exist to translate from one dimension to the other. It is easiest to establish them through the paths of least resistance--the magic frequency windows. Magic window induction works like a transducer. Modulation of the primary flux happens through jitter or dither. In the continual,virtual, subquantum, orthorotational flux (crosstalk), rotating into and out of a fundamental mass particle, only the components that are coherent are additive. Only those that add to the quantum threshold and breach it become observable quantum change. This is the threshold where it is possible for virtual mind to effect virtual matter and real time. It is the basis of all magic, sympathetic response, synchronicity, invocation, visualization, correspondences. The translation comes through the process of kindling a response in the primary medium of expression (the virtual state entities).So be careful what you imagine, visualize, or even think of yourself. Because we can physically confirm that thoughts become things! Our self-image is perhaps one of our most important creations. Our early experience of the environment conditions this image greatly. It imprints fundamentals such as whether the world is a safe place to be or not. Trauma locks up energies in the body, and the self image can become "frozen" and inhibit growth of the personality, especially in its expression of one's Higher Self or H.G.A. This image can be de-structured or liquified, (solutio), eliminating the old holographic pattern, and returning all elements to a chaotic state. From this chaos, the new image automatically emerges in regenerated form. This death/rebirth is commonly referred to as healing, and may be the mechanism of the placebo effect. Self image is locked up in identification with a multi-sensory image of self. It conditions the body and its state of health. The process of detachment from one's body, emotions, thoughts, and even the notion of self is a way of dis-identifying with the old outworn model, and creating a non-localized impression of oneself as contiguous with the universal consciousness. The "self-simulation," (Tart, 1990), carries consciousness from moment to moment, even though that "self" fluctuates through a variety of states and conditions. These are "internally generated virtual realities," according to "altered states of consciousness" expert, Charles Tart. He postulates a mechanism for self simulation and world simulation by boldly declaring that "we all live inside a world simulation machine." (1). The magickal body or body of light or Diamond Body can be used for identification purposes for consciousness journeys to realms which supercede physical manifestation. The DB or VEM function simultaneously as vehicles of consciousness and psychotronic energy accumulators. They focus intent and will much like a crystal can focus light. The pro-active approach is "learn--commit--do." Time is produced by the fission of the quantum of action. All remaining statistical subquanta which have not collected to the threshold level are virtual subquanta of action possessing unfissioned, unseparated time. Each and every piece of time contains dynamic, nested, virtual subquanta. Time in observable changes may thus be said to possess an internal dynamic structure filled with such virtual subquantum mental, neutrino, and photonic entities. Mind becomes matter, it matters, when virtual-mental entities cohere frequency wise until they breach the quantum threshold and discharge into observable quantum change. It is much like the accumulation of a static charge until sufficient potential is reached and a spark occurs, discharging the accumulation of charge. The same relationship exists between virtual-mental state and observable state. The only diference is that virtual-mental state accumulates by frequency or time phase. Perhaps you can draw your own conclusions about what this might mean concerning magical timing and tides, as well as regularity in practice. If you are going to charge your magickal machine, your altar which is the temple of yourself (the temple of self amplification), there are protocols for maximizing the "charge." This is also the basis of the magical egregor and group ritual. The "many minds model" has always contended that the force of concurrent magical visualization and effort is cumulative and exponential. At the quantum level, a physical change is totally statistical to a monocular observer, but this is not so when many minds are involved. It is why the quantum world is statistical rather than causal. This mind/matter interface is not a causal model--your mind doesn't cause matter to change per se. The virtual entities you fantasize manipulating are mind or consciousness themselves--stuff that is not different from matter or yourself in its deepest essence. We can regard a fundamental particle as simply a complicated three-space tuning pattern existing in the orthorotational crosstalk flux between orthoframes. Our bodies are composed of nothing more than that. Thus we are "vibrations" just as the ancient Indians, Theosophists, psychedelic movement, and physics reveal. Thus each fundamental particle is a set of tuning frequencies in the flux. A stable particle is a stable spectrum comprised of standing waves. And again, we are that. And yet the fabric of our being constantly comes and goes. We shed skin cells, and rotate our whole inards every seven years. Our atoms are continually being created, destroyed, or exchanged with the environment. Unstable particles are unstable sets, comprised of some standing waves, which account for the duration, and some not-quite-standing waves, which account for the excited state or degree of instability of the object. Particles can be destabilized by such subliminal thoughts as "I am a bad person, and deserve punishment." Core issues like this can lead to thought patterns which de-stabilize systems in the body and lead to a diversity of diseases ranging from those described as psychosomatic to those which pronounce a death-sentence, such as cancer. Every fundamental particle is a tuning. We know this fundamentally when we speak metaphorically of being in and out of "tune" with our real-time life situation. Paradoxically the flux tunes and is the result of its tuning. Current speculation about the nature of sub-quantum reality bears on the philosophical nature of the vacuum, the Void, and the persistent notion of a fundamental "ether." Our approach is that of the alchemist who would unite psyche and matter. 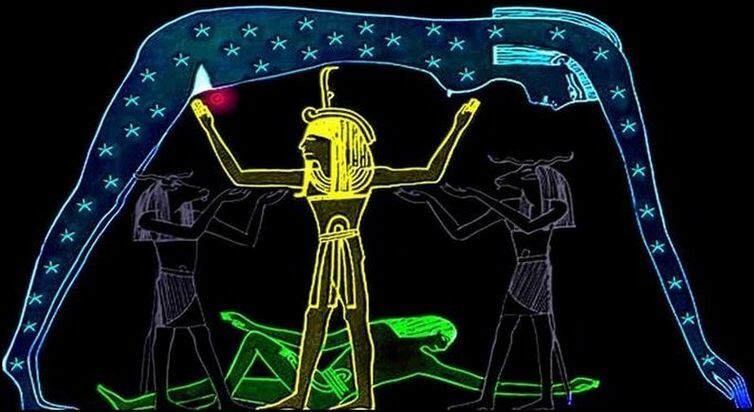 The quantum cosmology suggested by scalar electromagnetics finds mythic resonance in Aleister Crowley's resurrection of the Egyptian deities, Nuit and Hadit, in THE BOOK OF THE LAW. Nuit is infinite space, that which is naught, the continuous One, the Void, infinite potential, the Plenum. Hadit is any point which has experience of these possibilities. Crowley also characterized it as motion. Their interaction represents the relationship of the Whole to the seemingly discrete. Nature has no absolute laws, and nothing is absolutely prohibited a priori. At the microscopic level, there is no such thing as a "fixed" or "static" anything. Everything is in incessant motion. What we see macroscopically as a "fixed" object is actually composed of very small parts that are always in violent motion. Macroscopically static "force" actually consists of a myriad of microvectors, each moving and doing work against resistance. The macro static force is composed of micro work. Any vector can be replaced by two scalar fields. The interference of two scalar EM potentials constitutes a vector EM field. Any vector EM wave can be replaced by two scalar EM waves. Waves of potentials (electrostatic and magnetostatic) exist in vacuum, and the coupling of a spinning charged particle to these potential waves constitutes the force field waves actually detected and measured by our instruments. SCALAR EM VIEW OF THE VACUUM The vacuum -- and spacetime -- can now be considered to be made of photon-structured gravitons and supergravitons. In other words, the "graviton" can be regarded as a "piece of the vacuum/spacetime medium." Gravitation is simply infolded and trapped electromagnetic energy, and electromagnetic energy is simply the outfolded contents of gravitational energy. Gravitational potential is "locked up" electromagnetic field while an EM field is "unlocked gravitational potential." Vectorially speaking and roughly put, gravity is operationally zeroed or "trapped" electromagnetics, and electromagnetics is operationally broken-out or "bled off" gravity. In the modern quantum mechanical view, the vacuum is not an emptiness, but instead is a plenum or fullness (Puthoff, 1989). Today the vacuum is considered to be filled with incredible virtual particle activity. From nowhere, virtual particles continually arise -- even with fierce energy -- then disappear again into nowhere, so rapidly that they cannot be individually observed. However, these virtual particles are quite real, for they cause all the forces of nature when they interact in the aggregate with observable particles. Thus the vacuum is viewed as a seething inferno of virtual particle fluxes, and the concept of an ether is again accepted as referring to this "virtual plasma" or "virtual flux" vacuum -- which is a far different ether than the old material ether that was theorized prior to relativity. CONTINUALLY, EVERY TYPE OF PARTICLE IMAGINABLE SPONTANEOUSLY ARISES (CREATION) AND DISAPPEARS (ANNIHILATION) AT EVERY POINT IN THE VACUUM, ACCORDING TO MODERN QUANTUM MECHANICS. The rate of this virtual particle creation and annihilation in the vacuum is essentially unlimited. Further, any virtual particle created has a flux of even finer particles associated with it, and each of those has a yet finer flux associated, and so on without limit. The vacuum's virtual particle flux is thus comprised of nested levels of ever finer virtual particle fluxes, in the modern view. Each deeper virtual level may be modeled as a higher dimension (hyperdimension), to yield an infinite-dimensional vacuum spacetime (hyperspace) that is identically the infinite nested levels of virtual state. At the same time, every nucleus in the universe is continually absorbing and emitting scalar EM (electro-gravitational) waves, and these waves of pure potential are waves in the stress and structuring of the vacuum itself. HENCE, AT EVERY POINT IN THE VACUUM, AN INTENSE FLUX OF THESE SCALAR EM WAVES, WITH CONCOMITANT INTERFER-ENCES, EXISTS AND CAUSALLY DRIVES (CONSTITUTES) ALL THE ENORMOUS QUIVERING OF THE VACUUM SPACE-TIME MEDIUM ITSELF. To the observer, from a purely statistical viewpoint, in this violent vacuum flux any and every finite patterning of particles is also continually being momentarily created and destroyed -- and at every level and in every hyperdimension. THUS, IN THE VACUUM THERE CONTINUALLY EXISTS -- AT ANY AND EVERY POINT, AND IN ANY AND EVERY REGION -- THE GHOSTLY IMAGE OF ANYTHING AND EVERYTHING, WHETHER IN THE PAST, PRESENT, OR FUTURE; AND WHETHER POTENTIAL, PROBABILISTIC, OR ACTUAL. Rigorously, the universal vacuum may be taken to be a sort of giant hologram, for the whole is in each part, albeit in ghost-like manner. Everything that is, or was, or shall be; and everything that could be but isn't, wasn't, or shan't be: already exist at once, anywhere and everywhere, in this ghostly, holographic, virtual state. This image of reality is directly implied by quantum mechanics. It is not metaphysics. There has been a problem of missing chaos in QM theory. Scalar waves seem to be the missing ingredient. The hidden order in the vacuum fluctuations shows them as chaotic instead of random, though still statistical. Chaos theory describes nonlinear dynamic systems, far-from-equilibrium. Chaos displays certain qualities, all of which apply to scalar wave theory: nonlinear, dynamic, deterministic, far-from-equilibrium, disintegrated, negentropic systems of potential energy. WE CAN FURTHER EXAMINE THE FLUX OF ONE TYPE OF VIRTUAL PARTICLE THROUGH A POINT (Hadit) IN THE VACUUM (Nuit). Virtual particle flux creates a charge at that point. Various kinds of fluxes constitute various kinds of charge, and comprise various kinds of potentials. One type of charge may always be decomposed (disintegrated) into other kinds of charge, as can potentials. The magnitude of the electrostatic scalar potential at a point in vacuum represents the magnitude of the flux of virtual photons through the point, and hence the electrical charge at the point. The vacuum is filled with (and consists of) many types of "potentials." The overall vacuum potential remains the same from point to point, though individual potentials may vary. We can view the vacuum/ether/spacetime as a special sort of gas, where the "gas" is actually a mixture of many, many gases. This peculiar gas exists in five or more dimensions and is composed of very strange, fleeting particles which spontaneously are created and destroyed, each arising out of nowhere and returning to nowhere almost immediately. There is only miniscule (negligible) time overlap (integration) of the existence of these virtual particles in the main. Mostly each virtual particle -- along with its associated energy, movement, momentum, charge, and increment of time -- exists almost entirely as an individual. Thus the energies, movements, momenta, charges, and time increments of the individual virtual particles do not integrate or sum to any appreciable degree. These are densities of disintegrated energy, momentum, and time flow. In scalar EM, the disintegrated energy of vacuum is termed ANENERGY. Virtual energy is disintegrated, observable energy is integrated. The integrating agent is usually the spin of an observable particle of mass. The vacuum contains enormous anenergy, but essentially no energy. The "energy density of vacuum," "stress energy density," and "vacuum energy," are misnomers. The Russians describe it as "the information content of the field," but not in the sense of normal communications theory. Maybe we should call it the "unformation content." The realm of the vacuum is pregeometric. It has been described as vector zero summation, and described extensively by R. Buckminster Fuller in SYNERGETICS 1 and 2. But vector descriptions are wholly inadequate to describe something that is more fundamental than vectors. Fuller spoke of the VECTOR EQUILIBRIUM MATRIX because that was the most sophisticated language available then. He noted the weird mathematical anomaly at the center of the figure where normal space/time breaks down. But there are shortcomings in vector analysis. The concept of vector has both direction and magnitude, but a scalar has only magnitude, since it does not exist in the 3-space of Cartesian coordinates. Vector space is abstractly defined as a space which can contain objects called "vectors." Fuller called this system the ISOTROPIC VECTOR MATRIX, an omnidirectional grid of tetrahedra filling all space. If scalars have any relationship to vectors, it is that they are perhaps the essence of disintegrated vectors -- chaos. "Zero vector" is an entity defined in vector analysis by a set of operations. It is simply "the absence of any vector of finite magnitude." By implication, in abstract vector theory, all zero-vectors are defined as identical. But this doesn't include the influence of the real-though-intangible stress gradient in the vacuum. In the abstract mathematical model, vector space has no such thing as stress, and a zero-vector has no structure. That is why Vector Equilibrium is a "system" not a structure. Its anomalous center is a chaotic, disassembled system. The presence of summing vector component forces creates a stress and macroscopic structure in the physical medium in and on which the forces are acting. Even in a vacuum, the stress of the medium and its structure must be preserved and accounted for as charge and energy conversion between one kind of charge/potential and another. SEPARATION OF VACUUM AND OBSERVABLE STATES Because the energy density of vacuum is unintegrated, an integrated physical body -- including one's own personal body -- can exist "in" the vacuum medium of incredible "energy" density, yet observably exist in a medium of zero energy density. The unintegrated vacuum ether has enormous spatial density of virtual energy, but essentially has zero spatial density of observable energy. In the hyperdimensional interpretation of the levels of virtual state, the vacuum spatially does not exist in the normal 3-space of observable matter. The vacuum occupies the 4th dimension (time) and all spatial dimensions (hyperdimensions) greater than the third -- it occupies all levels of virtual state, but not observable state. Exchanges occur between normal 3-space and the hyperspatial vacuum, through the common connecting dimension, time. Exchanges of virtual particles are integrated by the spinning observable particle into the first quantally excited state -- "collapse of the wave function," the production of unitary quantum change, and the discretizing of observable change. Time is the only "dimension" where everything (Nuit) can be considered to occupy the same "point" (Hadit) or interval, but it is discretized and chopped into pieces, quite different in nature from the familiar three spatial dimensions of the observable universe. The dimensional separation (spatially) of the seething vacuum "energy" (anenergy) and the 3-space of normal matter allows a physical body to interact with the vacuum (chaos) at or near equilibrium at the microscopic level, but maintain its macroscopic form and stability. Vacuum/spacetime consists entirely of potentials, nothing else, and these are hyperspatial a priori. The vacuum does not contain force fields per se, nor any other non-potential entity. No vector force exists in vacuum. Force is an effect not a cause. A differentiating operator must be applied to (coupled to) a potential in order to produce a force field. The most usual is an observable spinning charged particle which couples to the stream of virtual photons. Its spin integrates the unobservable, disintegrated anenergy of the gradient flux into integrated, observable energy of the particle. This translates into the observable electric field which is only a potential in vacuum. If potential exists as an unintegrated virtual particle flux (VPF), it can be "zipped" and "unzipped" as force. The electrostatic scalar potential is composed of a myriad of little individual virtual-particle "electric force field" vectors, the smear of the virtual particle moving over time. When these little virtual vectors are essentially separate and unintegrated, the electric field is unzipped in vacuum, the E-field vectors are unintegrated. A potential is always an unzipped vector field of unintegrated virtual vectors. The spin of an observable charged particle zips or integrates an energy. The spin of the observable particle acts as the "zipper." Vacuum is unzipped; observable mass is zipped. Any zipped entity exists observably in 3-space; any unzipped entity exists in hyperspace, and is unobservable and virtual to the 3-space observer. This interpretation is still consistent with the quantum mechanical view, where ultimately all observable forces are considered to be generated by absorption and emission of virtual particles by/from an observable particle (mass). So force becomes an effect, not a cause. The primary causative agents are potentials, not force fields, as is now firmly established in QM. Zero-summed EM force vector systems stress the vacuum. A patterned system of oppositive forces forms a stress in the vacuum medium. It is the alchemical "holding the tension of the opposites." This stress is oscillation. This oscillation which we call a scalar electromagnetic wave is a GRAVITATIONAL WAVE, since the local curvature of spacetime is being oscillated. This internal stress in the medium has several characteristics which identify it as chaotic in essential nature. 7) since excess negative time flow may be locally produced, NEGENTROPY may be locally produced. When the vectorially zeroing components are dynamic, the scalar resultant is dynamic. The dynamic scalar term is the scalar EM wave. ENGINEERING THE VACUUM A "vectorially zeroed" EM system (Vector Equilibrium Matrix) stresses and deterministically structures local spacetime. It changes the energy density of the local vacuum, and curves local spacetime. Spacetime curvature must be of such direction that a local energy "source" exists. This curvature affects the local flow of time. Negentropy is a direct result of a local curvature of spacetime. The "locally trapped energy" constitutes a potential. This vectorially zeroed EM system, which has trapped its dynamic energy inside a local area, creates and constitutes an artificial potential in the local vacuum. This potential means dynamically structuring the vacuum, the virtual state through hidden variable theory. With this technology we can directly engineer quantum change, skew or change the probabilities propagated by the Schroedinger wave, and engineer the atomic nucleus directly with miniscule power. One simply oscillates each component of the zeroing structure in common phase, always maintaining the overall zero EM vector resultant as a scalar wave or gravitational wave. Scalar EM theory makes it possible to model the mind and its relationship to physical reality. It is the mechanism allowing mind to affect matter, for example in healing. Mind consists of EM fields. Passage of an electromagnetic wave through the vacuum leaves an invisible trace. The vacuum "imprints" everything that happens in it. This imprint is electrogravitational; i.e. the imprinting process structures the substructure of vacuum spacetime (the artificial potential of vacuum). The vacuum/ether/spacetime is composed of gravitons. This means that the mind/memory/personality are centered in dynamic photon structures inside structured gravitons, which in turn comprise artificial potentials that are centered in the atomic nuclei of the matter in the body. In the late 1960s, Lisitsyn reported that the Soviets had broken the "genetic code" of the human brain. He stated the code had 44 digits or less, and the brain employed 22 frequency bands across nearly the whole EM spectrum (note the 22 Paths of the Tree of Life, 22 Tarot Trumps, 22 primary archetypal modes of information transfer and feedback). However, only 11 of the frequency bands were independent ("11 is the key to all the rituals."). This work implies that, if 11 or more correct frequency channels can be "phase locked" into the human brain, then it should be possible to drastically influence the thoughts, vision, physical functioning, emotions, and conscious state of the individual, even from a great distance. The human brain and nervous system use highly complex substructuring of gravitons and supergravitons, rather than photons to perform mind functions. Thought and personality are directly explainable in terms of scalar EM. Chemistry is based totally on charge and charge distribution. If you control charge and charge distribution in the body, you can control all the biochemistry of the body, with miniscule voltages and currents. Engineering the vacuum may lead to true transmutation of the elements. If two weak monochromatic EM waves are run together 180 degrees out of phase, and run through a nonlinear medium so that they modulate each other and lock together, they make a strange "scalar EM wave" that is an electrogravitational wave of pure potential, and one that you are controlling. Such a wave goes down through the electron shells of the atoms, and is absorbed in the nucleus. If you choose the right mix of waves in the scalar wave, and just keep irradiating the nuclei with that "pattern," the nuclei will gradually rearrange themselves. For example, they will be transmuted into another element, given the proper signal mix. That is how biological systems transmute elements using millivolts and microwatts of power (Kervan effect). The scalar EM wave passes through the electron shells of the atom essentially without interaction, entering the nucleus. There it is dephased and absorbed, exciting the nucleus in a particular, structured manner. The nuclear potential is increased by assuming the imposed deterministic substructure. The nucleus will slowly charge up with the impressed pattern, steadily "kindling" (linearly integrating) a common virtual pattern until the observable threshold is breached and observable change occurs in the nucleus. Depending on the structure imposed on the scalar wave and in turn upon the charging nuclear potential, various actions--like transmutation can be created directly in the nucleus itself. MIND IS OBJECTIVE A point (Hadit) can be considered to be, and modeled as, a line in a frame one orthogonal turn away, and simultaneously as a plane two orthogonal turns away, and simultaneously as a solid (in fact, an entire three-dimensional physical world) three orthogonal rotations away. THE LATTER MAY ALSO BE CONSIDERED TO BE, AND MODELED AS, A MIND, OR EVEN AS AN IN-FOLDED SET OF MINDS. The concept does not stop at three dimensions, but proceeds into higher realms indefinitely. However, three dimensions plus an orthogonal time dimension are sufficient for our purposes. TIME IS MIND. In time differentiating, mass loses the time dimension. Therefore we cannot see time with a mass perceiver, but we can see spatial extension (Cartesian coordinates, Lorentz frame, Cube of Space). But time is the only so-called objective dimension occupied or shared by mind. Therefore we also cannot normally perceive the mind because the dimension time is lost in the perception process. Time does not exist except with respect to between one spatial extension perception and another, if the only output signal is the 3-space of natural perception. PHYSICAL TIME IS TOTALLY RELATIVE, TOTALLY MENTAL, AND EXISTS ONLY IN MEMORY. Mind is thus present in four-dimensional physical phenomena and is discretized along with time discreteness in the Heisenberg uncertainty relation. Mind creates time by establishing and comparing 3-space realities. The only place the former perception of 3-space can rigorously be found is in memory. An event, once occurred, is in the past and is forever gone to the observer. Only in his memory can it be said to exist. But then so is the observation also of the most recent event. Thus rigorously, OBSERVED PHENOMENA MAY BE SAID TO EXIST ONLY IN MEMORY, and there is only a past, never a present. THUS A FULL FOUR-DIMENSIONAL MIND IS INSEP-ARABLE FROM PERCEIVED PHYSICAL PHENOMENA, AND MIND IS QUAN-TIZED ALONG WITH QUANTUM CHANGE IN THE PHYSICAL WORLD. On the boundary interface (such as skin), one type of field may be turned into another. The psychotronic field (biofield) may be turned into an electromagnetic field and vice versa. The boundary interface serves as a transfer function mechanism for translating one kind of effect into another. Both ends of the transfer functions are excitonically united in and on the interface. For example coherence of cyclic rhythms like breath and heartbeat during psychokinesis. Man, earth, and cosmos are psychotronically and coherently linked. The boundary of an object is a transducer coupling internal and external dynamic changes in one-to-one correspondence. The transducer effect applies to both living and nonliving systems. Through tuning and resonance, internal patterns can be incepted externally, and external patterns can be incepted internally. (For more on resonance effects and consciousness, seeSTALKING THE WILD PENDULUM, Itzhak Bentov, E.P. Dutton, New York, 1977). Local curvature of spacetime means a thing in one frame can be something quite different in another frame, in respect to the observer's static frame. What a thing is, is totally relative to the perceiver and his perceiving frame. It can even be nothing in a great many frames. THIS IS HOW NOTHING (NUIT) CAN CONTAIN EVERYTHING (HADIT). So we really can turn nothing into something if we are clever. We can tap zero-point energy, psychotronically (mentally) and physically. We have a scheme of multiple worlds and multiple realities from which we may construct living systems, thoughts, tulpas, etc. And we may also turn one type of field into another, simply by virtual state collection or separation, as the case may be. Some frames are mental or virtual, yet they are just as real as 3-space entities. In this system mind is modeled in terms of physics and physical reality is modeled in terms of mind. The only difference between any two entities in the various worlds is a matter of orthogonal rotation. EVERYTHING IS A THOUGHT IN AT LEAST ONE FRAME. EACH ENTITY IS A PHOTON IN AT LEAST ONE FRAME (LET THERE BE LIGHT!). By orthogonal (90 degree) rotation, a thing can change its face with respect to an observer, appearing to change into a totally different sort of thing with respect to a fixed object in one frame. Reality is quite plastic and absolutely unlimited. Materialization of an object, by three receding orthogonal rotations, exists. In such a case the dematerialized object appears the same as a thought object or virtual object. A perfectly valid mechanism thus exists for tulpoids, materialized thought forms (U.F.O., Bigfoot, etc.). All that is needed is a sufficient virtual state collection mechanism (such as Vector Equilibrium Matrix). An object may be kindled from a remote frame to one that is less remote. Two successive applications of kindling turns thought into electromagnetic field. Three kindlings turns a thought object into a materialized object, a tulpoid (a Tibetan Buddhist term). Such a materialized thought-object may be of an inert object or of a living, breathing, biological being. The model we are working in has eliminated any superficial difference between living and nonliving because it is a four-law model. A materialized living being will be just as real and physical and functional as any other person on this earth. Ultimately, that is all that we ourselves are -- tulpoids. NOTHING EXISTS BUT THE THOUGHT OF THE INFINITE CREATOR, AND WE ARE SIMPLY PART OF THAT THOUGHT. The coherence in multiple stages necessary to accomplish kindling is often referred to as tuning in this book. Tuning sufficient to enable two orthogonal rotations results in thought turning into electromagnetic field or light. Such a kindled field may be additive or subtractive to existing electromagnetic fields. Thus kindling can cancel an electromagnetic field that already exists, or it can create one where none previously existed, or it can shape, modulate, or change one which already exists. Kindling can also wipe out the charge on a charged particle, or it can build up a charge on an object which previously had no electric charge. Any changing entity in any frame crosstalks a tiny amount into any other frame, but it may be so small as to be virtual, hence unobservable. Coherent virtual crosstalk, integrates and can breach the threshold between virtual and observable state. Another point to notice is that most fundamental particles in a frame rarely move with ocntstant velocity. Instead, they normally accelerate and decelerate continually. Thus the actual velocity vector of one of these entities is continually changing, usually quite erratically (chaotic?). But for microscopic particles in regular atomic or crystalline formations, the change pattern is quite regular. (Ref. the DIAMOND BODY). The constant changes on the velocity induce a jitter component on its crosstalk into other bioframes (see Fuller on "jitterbug" transforms of V.E.M. and octahedron). So the crosstalk into a frame is jittery. Thus a fundamental particle is jittery or wavelike. The fine structure constant of an electron encompasses this hyperspatial jitter or wavelike state of the electron. The fine structure constant is about 1/137. Thus an electron actually spends about 1/137 of the time in hyperspace. Because of jitter, an object is partially in every hyperframe a minute but finite part of the time. So are all minds and mental objects, and so are all virtual objects. The identity coefficient shows how much the fundamental particle pervades another frame. For an electron to orbit in an atom (or for any other electron, for that matter) there is a small but finite probability that the electron may be at any given position in the universe when its detection occurs. In other words, there is a finite probability of collecting an electron at any point (Hadit) in the universe (Nuit), and the collection may be made from multiple points simultaneously. Space-point, mind, and thought are virtually synonymous. BIOFIELDS AND TULPAS: PROJECTION AS REALITY By proper coherent tuning through time synchronization, an object from a maverick world of fantastic possibilities can be orthorotated into our own frame and objectified. THISIS WHAT TIBETAN MONKS CALL A TULPA, AN OBJECTIVE MATERIALIZATION OF A THOUGHT-FORM. The tulpa will hardly ever be closed entirely in phase, however, and so it will almost always be unstable. UFO's, angels, and imps go away. But the materialization of one of these can be entirely objective and perfectly objective traces can be left, such as photographs, broken limbs, scorched asphalt, indentations, and depressions in grassy fields. Any thought object can be so orthorotated and objectified. Beings, religious figures, angels, fairies, imps, UFO's, and monsters can all appear. At death, the now disembodied mind finds itself in its own deep, unconscious world constructs. Reincarnation is simply the resonant coupling which automatically establishes itself in the flux. The disembodied, confused mind will simply be coupled again to a new physical body pattern. This happens at the instant of conception, for the genetic pattern--the complete tuning pattern--is present at that instant. The coupling is quite tenuous at first, and increases in degree as the embryo develops. So, the cycle of rebirth can be broken completely--simply by dying with a totally detached mental framework. The cessation of all tuning attachment results in structureless, hence all-structured being, part of universal Godness. THE MAJOR POINT IS THAT ALL THIS CAN BE MODELED PHYSICALLY. THERE IS ONLY LIFE; ABSENCE FROM ONE PLACE STILL LEAVES PRESENCE IN ANOTHER. Absence from any and every one place exclusively leaves presence at all places, each nonexclusively. CONSCIOUSNESS -- THE THREAD OF THE RELATION BETWEEN CONSECU-TIVE CHANGES IN THE TWO RESPEC-TIVE FRAMES -- AND TIME ARE IDENTICAL. Time is a duration of consciousness. Thus time and mind are identical. So are time and universal mind. Consciousness is simply the functioning of coherent crosstalk between a mind frame and a physical body. Each biosystem's consciousness has all other consciousness interwoven with it. The entire universe of universes is totally in communication with each part of itself, continually. Incepting a change from pure causality changes the past. The past is causally inferred or projected backward from the new vectorial direction. Inception of course also changes the future slightly. Hidden variable theory (chaos) which causes a radioactive nucleus to decay, is also a mechanism which can directly amplify the virtual-mental state into observable state. It is the fundamental mechanism that causes kindling and thus orthorotation. It can be used to materialize tulpas, accomplish psychokinesis, clairvoyance, precongition, etc. The effect is based on the concept that a human being must accomplish a minute inception onto his phsycial system. Specifically, he must incept the movement of three or four electrons in the brain. This input signal into his physical system amplifies the movement of several electrons into powerful movements of the entire body. Intelligence may be viewed as the ability to adapt behavior, and increased intelligence represents a decrease in the portion of behavioral control that is genetically programmed or "hard-wired." The common crosstalk in all minds constitutes the collective unconscious. Since the common crosstalk is in a sense a mind, and since it is connected to a "body" of many cells, i.e. of four billion humans or so, then this collective unconscious is a living, breathing entity. Most of what we term physical reality is prescribed by the collective human unconscious. And if the collective human unconscious is changed in its conception of reality, then four billion stages start kindling with the hyperchannel effect, and immediately the new conception is physical reality. BORROWING FROM JUNGIAN PSYCHOLOGY, LET US CALL EACH FORM THAT IS IN EACH HUMAN MIND AN ARCHETYPE. Let us also realize that there are shallower levels of unconsciousness between the total collective unconscious and an individual mind. An archetype that is kindled from the collective unconscious is kindled through such a mechanism of unconscious levels of tuning, and the reality format that is kindled is determined by the type of pressure and the content, biases, or tuning of all the levels between it and the conscious minds of the individuals who observe the phenomena. All tulpoidal manifestations are kindled through this mechanism. All of them are shaped by the multilevel unconscious tuning. ALL OF THEM ARE CAUSED BY AN UNRESOLVED CONFLICT IN THE DEEPER UNCONSCIOUS LAYERS. Though short-lived because of unstable tuning, any tulpoidal materialization may be physically real during its stable period. This includes angels, imps, Virgin Marys, UFO's, sasquatches, Loch Ness monsters, lake monsters, sea monsters, mystery lights, fairies, elves, devas, devils, ogres, men in black, goblins, monster birds, and cattle mutilations. An infinite number of reality channels exists. The total instrumental characterstics, genetic, psychological, and physiological, of the observers who tune in the channel determines the noise content and actual channel selected. A reality is simply an orthogonal frame or world. All possible realities exist. A channel is a set of tuned and timed orthorotations communicating back and forth between two orthogonal frames or worlds. Tuning is a complex of mind and matter, and of many unconscious levels. By time coherence in the virtual state, a virtual entity can be amplified into observable state. From sheer nothing (Nuit) we can produce something (Hadit). And since every possible something exists in nothing and is available for cohering, we can get anything at all by this process, at least hypothetically. DREAMS AS UNRESOLVED CONFLICTS Everything is essentially mind. Mind forms layer after layer of overlapping zones of shallower and shallower unconsciousness (multiple simultaneous consciousness), all the way from the universal allness (Nuit) to the personal unconscious (Ra Hoor Khuit). It culminates in each conscious mind. JUST AS THE DREAMS OF AN INDIVIDUAL SHOW HIS UNRESOLVED CONFLICTS, SO THE MATERIALIZED TULPOIDS OF THE COLLECTIVE HUMAN UNCONSCIOUS SHOW ITS UNRESOLVED CONFLICTS. At the other end of the spectrum, a human culture seeks and "obtains" a godform or god-image consistent with its own level of understanding and belief. The resulting tulpoidal activity conditioned into the collective unconscious and the cultural unconscious, and tuned in from them, will be consistent with the cultural desires and expectations. So in a sense we are the creators of our own reality and our own tulpoidal expressions of higher reality. But in addition to tulpoids, the present character of spacetime and dimensionality, and the very laws of the physical universe, are largely proscribed by the collective human unconscious. VIRTUAL CHAOS VECTOR EQUILIBRIUM AS ZERO MODEL; ZEROPHASE: Being the zerophase of energy the vector equilibrium is inherently invisible and non-empirically-discoverable, which accounts for its having been for so long unrecognized as the spontaneous equilibrious model. As specialists, scientists seek only the somethings. The vector equilibrium is the only model of nonbeing zero-inflection at the nomoment of omniintertransformabilities, where anything can happen and must happen single-atomically within and multiatomically without. Speciali-zing science, seeking only somethings, inherently overlooked the nonthing vector equilibrium. Vector equilibria in isotropic vector matrix produce the discontinuity of particles, while the vector-weaving around the VE nucleus produce the continuity of wave phenomena. The vector equilibrium is the most abstract of all the always-and-only abstract scientific generalizations, for it is the heart of all interrelationships existing between -- and not in or of -- any of all the empirically apprehended intertrans-forms of the every-and-everywhere intertransforming Scenario Universe. The vector equilibrium is the zerophase--ergo, inexpressible--interrelationship of all Universe events. VIRTUAL STATES AND HYPERSPACES In physics today there are two separate kinds of reality: observable changes, which can be detected by instruments; and virtual changes, which cannot be detected by instruments, even in theory. Changes smaller than the quantum level are said to be "virtual" and undetectable, and changes larger than this are said to be observable and detectable. Virtual changes are not bound by the conservation of mass law. And virtual photons can have nonzero mass. Rotation just past the critical angle corresponds to a Lorentz-Fitzgerald contraction into the virtual state below the quantum threshold of the detector's observable universe. But there is a jump effect which happens during the orthorotation of light, or acceleration to the speed of light. Mass turns into photons during the final part of orthorotation which is in the virtual state. This is the missing link between relativity and quantum mechanics. Continued rotation into hyperspace passes through successively finer, nested virtual sublevels or subthresholds of lab space. (of the Lorentz-Fitzgerald contraction). The successive breaching of deeper thresholds is due to continued Lorentz-Fitzgerald contraction. Higher hyperspatial frames constitute nested sublevels in the virtual state with respect to the laboratory observer. Thus a direct connection exists between virtual levels and hyperspace frames. HYPERSPACES AND VIRTUAL SUBLEVELS ARE THE SAME THING. Every "virtual" object in lab space is an "observable" object in some hyperspace. Hyperspatial engineering and virtual state engineering are one and the same thing, and this is what PSYCHOTRONICS and SYNERGETICS are all about. For physical, observable systems, we can model six vectors for every point (Hadit). This is the natural geometry of nuclear structural systems. The most economic system is 12 around 1, closest packed spheres--the intertriangulated geometry of the atomic nucleus. The vector equilibrium is the prime, nucleated structural system of Universe. Fuller says, "The behavioral interpatterning frame of reference of the six degrees of freedom in respect to omnidirectionality is of course the vector equilibrium, which embraces the three-dimensionality of the cube and the six-dimensionality of the vector equilibrium. Experience is inherently omnidirectional; ergo, there is always a minimum of 12 "others" in respect to the nuclear observing self." Because NUIT is the time/space continuum, time must be "nothing," much like the void of the purely spatial dimension. Time may be considered as a sort of box containing all observables and virtuals. Indeed, time is neither observable nor virtual; time is simply a parameter in quantum mechanics. Rigorously, time may be said not to exist. Indian philosophy identifies universal mind with time, and calls it Kal, Lord of Karma. TIME ITSELF IS NOTHING, TOTALLY NOTHING. Therefore by the fourth law of logic (identity of opposites at the boundary--paradox), it can be said to be or contain everything, the total mishmash of virtuals and observables. Since in the absolute sense there is no such thing as time, then all modeling of space, mind, thing, and nonthing must be done spatially. Relativity theory attempts to use time as an existent dimension of the same kind as length, limiting rotation in lab space only in the direction of the time axis in Minkowski geometry of spacetime. Spatial modeling requires an infinite dimensional space (NUIT) and an infinite number of orthogonal angles. The time axis that can be drawn in such a hyperspatial model has no meaning except with respect to a relationship existing between two or more hyperspace frames or objects. Specifically, the time axis represents the totality of all the hyperspaces and their objects, hence all the relationships that can be separated from the hyperspace. The charge on an electron is due to the continual emission and absorption of virtual photons (little electromagnetic pieces of vacuum, the space/time flux, or little pieces of nothing. The simple movement of the electron is actually composed of a virtual cloud -- an infinite number of an infinite number of an infinite number of things (manifold), all happening in a mad tangle of nested substrata in the virtual state. Each of these virtuals with respect to lab space is in fact an observable in some particular hyperspace. Many other sorts of virtual particles are emitted and absorbed and born and extinguished, in addition to photons, by various observable particles in free space. EVERYTHING IN EVERY POSSIBLE WORLD OR HYPERSPACE IS RELATED TO EACH AND EVERY OTHER THING IN THE LABORATORY WORLD THROUGH ORTHOROTA-TIONS AND NESTED VIRTUAL STATES. Cross talk between hyperframes is the emergence and disappearance of virtual particles in a particular frame. The universe is holographic. IF ANY PART OF THIS VIRTUAL CHAOS CAN BE COLLECTED AND COHERED IN EVEN THE SLIGHTEST DEGREE, ANY AMOUNT OF OBSERVABLE FREE ENERGY CAN BE OBTAINED. But back to our electron. If we now remove the electron, leaving empty vacuum, all sorts of virtual madness is still there and occurring. Vacuum is infinitely dense and filled with stupendous "zero point" vacuum energy; IT IS TOTALLY CHAOTIC AND VIRTUAL. Space itself is an infinite tangle of virtuals -- virtual projections from real observables in associated hyperspaces -- and these dynamic interactants make up any three-dimensional space and hyperspace itself. They are also what cause space itself to exhibit the finite nonzero parameters or values that must be accounted for in our physical equations. EVERY FUNDAMENTAL CONSTANT OF NATURE IS DYNAMICALLY CONSTRUCTED FROM -- AND DUE TO -- THE ZERO POINT, VIRTUAL VACUUM INTERACTIONS THAT CONSTITUTE "EMPTY" SPACE (NUIT). THE VIRTUAL "SEA" OF SEETHING WAVES AND PARTICLES THAT IS EMPTY VACUUM IS ACTUALLY AN ETHER -- A NON MATERIAL VIRTUAL ETHER. It is perfectly admissible by the Michelson-Morley experiment and consistent with the entire experimental basis of physics. EINSTEIN ONCE PROPOSED NAMING THE VACUUM AND ITS CONTAINED FIELDS THE "ETHER," BUT HIS SUGGESTION WAS NOT HEEDED. We now know something quite unusual about an electromagnetic wave and about a photon. Because it oscillates with respect to time, the wave moves along the axis of velocity in lab space for single wavelength, then repeats itself again and again. The oscillation actually represents an orthogonal, rotating etheric or hyperspatial flux about the velocity vector. All three vectors of an EM wave are comprised of nested tangles of virtual subvectors. This spinning (exploding and imploding) flux is coming into lab space from outside it (from virtual states) and returning into virtual states. It is a nutrino flux. (See Fuller for the synergetics of explosion/implosion; they relate to VEM). If the sine-wave cycle has enough energy, it leads to pair production, the creation of an electron and a positron. The positron is an electron traveling backward in time, just as Dirac predicted. During any time interval--including the period of a single oscillation of a photon--a photon may be considered to consist of an infinite number of virtual happenings, each consisting of an infinite number of subhappenings, and so on. It is much like the fractal nature of self-generation and self-iteration in nature. It repeats itself at all levels of organization. The photon itself may be considered to have a direct, nested virtual substructure, and this substructure is directly hyperspatial in nature as well. ACTUALLY THE ELECTROMAGNETIC FIELD IS NOT THE MOST FUNDAMENTAL FIELD, BUT IS SOMETHING THAT IS TORN OUT OF, OR SEPARATED FROM, A MORE FUNDAMENTAL FIELD: THE VECTOR POTENTIAL. Maxwell's equations and the normal concept of an EM wave and single frequency thus represents only gross envelops of the actual forms and structure of waves and fields. The personality covers and distorts the essence or soul in much the same way. NEUTRINIC WAVES CAN BE REGARDED AS A CIRCULATING OR SPIRALING WAVE IN AN EM FIELD. This may well be the spinning wave of orgone energy identified by Reich. Neutrinic waves interact more strongly with strong electrical or magnetic fields. The degree of interaction increases nonlinearly with the intensity of the fields with which the interaction occurs. We presently regard an EM wave as a wiggle of nothingness, existing in time. This is precisely the same as saying that a photon is an oscillation (wiggling) of spacetime itself. Specifically, it oscillates in two directions spatially, one being the electric field direction and the other the magnetic field direction. But since an EM wave itself constitutes a regular bending and flexing and curving of spacetime, including both space and time, then the flexing spacetime inside the photon can itself be further bent or twisted, and that constitutes a kinked or curved photon--a modulated photon. It is nonlinear, but our lab space instruments demodulate such a kinked photon into its linear components. Still the modulation of a wave results in direct changes in the virtual structure of the formerly unmodulated photon, relativistically warping or curving it. A mixture of waves and frequencies must automatically possess, carry, or represent hyperspatial-virtual patterns in the correct nonlinear medium that absorbs them. When we modulate a wave, we impress a time change on it, we differentiate it. We impress a differential operator function on it. In other words, to modulate an electromagnetic carrier wave is to add a hyperdimensional aspect -- specifically, neutrinic vector aspects of mind aspects. The whole affair can be thought of as merely shifting or altering the particular distribution of nested virtuals transported by the basic carrier wave. When we form a mixture of waves, we are adding virtual aspects (and hyperspatial aspects) in so doing, because of the phase differences. This is extremely important: COMPLEX MIXTURES OF WAVES AUTOMATICALLY CONSTITUTE AND CARRY HYPERSPATIAL COMPON-ENTS. Complex, dynamic mixtures are chaotic. And if we can accurately control these hyperspatial components, we are in effect doing direct hyperspatial engineering and virtual state engineering. By using two orders of modulation on a carrier, we can directly affect mindstuff itself. Time spikes can be introduced across the body as pulsed voltages. They are modulated directly on the dendrite firings of the brain and nervous system, providing direct and pulsed modulation of the neutrinic and mindfield component channels of the mind-brain-consciousness-life loop itself. Hyperspatial engineering, virtual state engineering, curved space, photon kindling, mind-life-consciousness engineering, and nested modulation are all the same thing. We directly engineer the virtual state, hyperspace, curved spacetime, and the life-consciousness loop itself, including the mind, with relatively simple devices that accomplish, transmit, and receive nested orders of modulations. For each modulation pattern, a particular virtual structure is impressed on the photon, which is the same as impressing a particular hyperspatial pattern upon it. Fundamental CHAOS shows up in cellular biology. In studying cellular electromagnetic bioactivity, the cell behaves as a system far from thermal equilibrium (deterministic chaos). In such a system negative entropy can result, and order can emerge from disorder. For a wildly disordered system, large-scale order can emerge and stabilize, and THE MORE CHAOTIC THE DISORDER, THE GREATER THE STABILITY OF THE ORDERED PATTERNS THAT EMERGE. TOTAL DISORDER MUST INEVITABLY TURN INTO TOTAL ORDER. LIVING CELLS PRODUCE COHERENT LIGHT WITH A LASERLIKE ACTIVITY. THIS COHERENCE SERVES AS A CONTROL FOR THE METABOLISM OF THE CELLS, REGULATES GROWTH, AND FIXES THE REPRODUCTION RATE. The cells exhibit superconductive behavior. Every living organism possesses a living aura, with a virtual photonic flux. In this field, virtual photons are stored. The field continually receives inputs (virtuals) from the environment and is continually outputting biophotons, particularly in the near ultraviolet. THIS FIELD, IN WHICH ALL CELLS ARE BATHED AND WITH WHICH THEY ALL CONTINUALLY INTERCOMMUNICATE, TENDS TO STABILIZE AND COHERE THE ORGANISM (Popp). IT'S ALIVE Stress-producing metaphysical gas stretches and strains nature to yield into social-evolution conformations such as the gas-filled plastic tube of Universe. --R. Buckminster Fuller The secret of the universe is that it's alive. Einstein's spherical model of the cosmos is a primary example of a holographic universe. In such a closed spacetime, each point inside the universe is also at the extreme end of the universe in any direction. Thus the entire physical universe (Nuit) is totally outside any of its internal points, and totally inside each internal point (Hadit) as well. THE TOTAL INTERNAL IS IDENTICAL TO THE TOTAL EXTERNAL. Harking back to quantum cosmology, we can speculate that our universe has many of the traits of a living thing. It was in a sense born from a hyperdimensional black hole in another stretch of spacetime, in another geometric realm. Physicist Lee Smolin of Syracuse University has postulated that universes are born to strive and live and die. They change form little by little--or evolve. A universe may give rise to a number of new universes, throughout its individual history. As in natural selection, the offspring with the most successful survival strategies prevail. The whole collection of universes may be said to evolve. Drawing inspiration from the Gaia Hypothesis, he extrapolates that the universe may be a mother, hatching baby universes that live and die, and, like the organic species of the earth, evolve. (See OMNI, Oct. 92, "The Bubbling Universe"). The universe, galaxy, and earth sustains life through a series of interrelated feedback loops. If one applies quantum theory to the geometry of spacetime as described by Einstein's theory of relativity, one can conclude that very tiny fluctuations in spacetime are taking place around us all the time. As a result, occasionally, a piece of our universe might bulge out, like a weak spot in an inner tube. Extending via a thin wormhole, the blob would stretch until the frail link snapped, leaving an isolated entity of space and time disconnected from our universe--a "baby cosmos," where the laws of physics might be quite different from our own. Coleman, Hawking, Baum, and Strominger have proposed that our own universe may "give birth" to offspring of a sort. Most are submicroscopic entities a billionth of a trillionth of a trillionth of a centimeter across. A great proportion would pop away from the parent cosmos only briefly before being reabsorbed. But a few might have the potential of turning into something much more vivid and impressive. Such "buds" can suddenly and extravagantly "flower," turning swiftly into gigantic, rapidly expanding entities massive enough to contain billions of galaxies; each entity constitutes a full-blown universe of its own. HOW COULD A TEENY-WEENY QUANTUM FLUCTUATION BOOT-STRAP ITSELF INTO A FULL-FLEDGED COSMOS? (Ref. the "butterfly effect" of chaos theory, pumping from micro- to macro- effects). With help from the dense, virtually inescapable center of a black hole, where the density of matter and energy becomes infinite. Just before matter in a black hole reaches singularity, a baby universe begins to expand. Our universe could have grown from the inside of a black hole in another universe. This reflects the mythic Qabalistic creation story of emanation of Kether, the Source, from the three negative veils of existence. Darwinism applies not just to organic life forms, but over megacosmic dimensions as well. We owe our existence and physical laws to the trial-and-error evolution of untold generations of prior universes, a chain of mother-and-child cosmoses, each of them spawned in the nurturing depths of black holes. (Ref. days and nights of Brahma=Om=108, number of the Universe). 1999 Update: All is motion, without and within. There is no force field in the vacuum, as such. But we can think of it as "virtual," rather than "observable." A virtual electric force field exists in the vacuum, comprised of accelerating virtual masses, but not an observable field. This is beyond the physical, and into the metaphysical domain. Observable particles can exist only in a physical medium. The ambient vacuum stress (potential) has a hidden internal wave structure. Its synergetic compressive stress reacts internally against atoms with their inner and outer parts. Reaction from the nucleus induces a tensile stress, which can be decomposed into opposing forces. The vacuum may become the central ingredient of 21st-century physics. It is technically metaphysical -- beyond the realm of physics because it is virtual, rather than manifest. These causeless fluctuations in energy create force fields that emerge from nowhere. Particles flit in and out of existence at the threshold of matter. Virtual subatomic particles pop out of nothing and instantaneously disappear. Therefore, so-called "empty" space is not empty at all, but a seething sea of activity that pervades the entire Universe. The vacuum "sea" is an inexhaustible reservoir of energy. Its permanent positive energy density is synergetically balanced by a negative pressure (a tension). This relates directly to the newest concepts about cosmic inflation in cosmology. Inflation predicts that the density of mass-energy in the Universe is right on the borderline between expansion and collapse. Vacuum energy can account for some of the missing mass predicted for the Universe. The rest is accounted for through inertia. Inertia is generated by acceleration through the vacuum. Fluctuations in the vacuum give rise to a magnetic field through which all objects move. As they accelerate, each particle feels the grip of this magnetic field, and that resistance is inertia. The larger the object, the more inertia. By altering the vacuum state, it could be possible to alter the inertia of objects. This opens a host of engineering possibilities. The vacuum plays a key role in structuring the Universe. Astrophysicists says that the vacuum accelerates charged particles, sweeping them up to form concentrations of matter surrounded by vast cosmic voids. Philosophers were right: Nature does abhor a vacuum. Even empty space is seething with activity. It is the vacuum energy fluctuations which cause "white noise" in electronic circuits, and limits the level to which signals can be amplified. Might this be the metaphysical basis of the audible life stream, the Sound, the Word in mysticism? "Jung's collective unconscious, for example, consists of archetypal infolded EM structures acting in common in an overall bio-quantum-potential for the entire species. Gaia, the living earth/biosphere, really does scientifically exist as a common bio-quantum-potential with infolded living EM structures for the entire earth biosphere. The bio-potential in a single body is an overall quantum potential that links and joins all the atoms and cells of the body. The "spirit" of the biosystem, if you will, is its "living biopotential"--its living quantum potential. We already know that a potential is everywhere nonzero all the way out to infinity. So the spirit of the living system is--in the virtual state--everywhere in the universe--and everywhen as well. It's all a giant hologram, not only in space, but in spacetime. The entire universe is everywhere alive, with everything. Note that if you simply examine the "ghost forms" requirement of quantum mechanics, this conclusion is inescapable. All life is eternal. Nothing is ever lost. A thought or thoughtform is just a specific, dynamic Whittaker structure in the hidden EM channels of the biopotential. Thoughts and thoughtforms are real. They are virtual spatially, but they occupy one "real" spacetime dimension, time. Physics and metaphysics share one common, nonobservable dimension: time. So long as physics continues to have to have time, which is nonobservable a priori, then it also must contain everything that is a structure or action in time. With Whittaker EM engineering, you can conceivably "make" thoughtforms to order, and input them directly into the mind and longterm memory. If we view the conscious mind as a special serial computer, we have now found where the software is--for mind, longterm memory, and personality. As scalar EM technology develops, we will have direct access to the software, so to speak, for the very first time. And we will be able to engineer it at will." What I call “scalar waves” are pure longitudinal EM waves (LW). Per a nice paper by R. Ziolkowski, whenever an EM wave starts to form, both the transverse and longitudinal waves start to form. However, the transverse wave has a function, which cancels the longitudinal wave. So if that function persists, we get the familiar EM wave. Now when we cancel the normal wave, we cancel the component that had cancelled the LW. So we get out a LW. A normal old EM wave is comprised of photons (or so we can consider it, if we wish). Now a photon is a piece of angular momentum. So it’s a piece of energy welded to a piece of time, with no seam in the middle, so to speak. What the “pieces of energy” represents, in the dynamic oscillating wave, is a dynamic oscillation of the energy density of 3-space. Now here physics does an odd thing. It just ignores the dynamics of all those “time pieces”. In other words, not only is the spatial energy structured and dynamic, but so is the flow of time (I discovered the mechanism that generates the flow of time when I was at grad school at Georgia Tech). Physicists just visualize the “observer time” flowing smoothly, and ignore the fact that the EM wave carries time dynamics as well as energy dynamics. When you make what is CALLED a transverse wave you ignore (or have a component that cancels) that time-density variation. That is a normal transverse wave; considered as an oscillation of the energy density of three-dimensional space, with a structureless, free-flowing time stream. When you make a longitudinal wave, by definition it cannot vary the energy density in 3-space. That is fixed. So it can only vary the time-density dynamics. In other words, a longitudinal EM wave is a time-density oscillation. That is, it oscillates the rate of flow of time itself, about some steady median value. We cannot measure time; we see that as a spatial change. So we observe it as a velocity-modulated wave. It seems to be increasing and decreasing its speed about some median speed. That’s what I have been calling a scalar EM wave. It is now recognized in the literature. A pure longitudinal EM wave has infinite energy and infinite velocity. We don’t make those. Instead, we make a pseudo-longitudinal wave; i.e., a “pretty good” longitudinal wave that still has some low-level transverse component. A pseudo-longitudinal EM wave has finite energy and finite velocity, but its velocity may be less than or greater than the velocity of light in free space. When it’s subliminal, it’s called an “EM particle”. Nimtz and his colleagues have also transmitted Mozart’s 40th symphony down a waveguide at speed 4.7c, and clearly listened to it on the other end. This blows the tar out of the old saw that “information cannot be transmitted superluminally”. In fact, quantum tunneling has been known to permit superluminal communication, for some decades. When Maxwell wrote his theory, everyone (all 35 or so of the good electrodynamicists; that’s all there were!) assumed the material aether (a material fluid filling all space). In other words, they thought that there was no place in all the universe that was devoid of mass. Period. So all the EM entities are DEFINED as mass entities: Electrodynamicists today do not actually have anything to say – anything at all! – about the form of EM entities in mass-free space. Even the scalar potential’s magnitude at a point is defined as the energy in joules collected upon an intercepting point Coulomb at that point. In other words, they have confused the magnitude of the water-collected in/on a standard bucket from a raging river, as the magnitude of the water in the river at the dipping point! The scalar potential itself isn’t even a scalar entity! It’s a multiwave, multivector entity. It’s a bunch of bi-directional rivers of EM energy, flowing in both directions at once. Of course, how much of that flow is diverged by (collected upon) an intercepting Coulomb, is a scalar value! But that has nothing to do with the magnitude of the potential itself, just the magnitude of how much is dipped from it by a standard bucket. So EM theory is thoroughly and seriously flawed, from the ground up. Now let’s see what happens when you transmit and receive a signal (simplest case). First, in the transmitter you perturb the Drude electron gas, which being embedded in a violent interaction with the active vacuum, perturbs the active vacuum. In other words, the mass perturbations in turn perturb the spacetime. Then that SPACETIME perturbation propagates to the receiver, where it interacts with the waiting Drude electrons, perturbing the Drude gas (the mass). Rigorously, we have a MASS-TO-SPACETIME TRANSFORM, followed by a SPACETIME-TO-MASS TRANSFORM. Neither of those appears in electrodynamics. Instead, by assuming the material there in the space, Maxwell and others assumed a MASS-TO-MASS TRANSFORM (INTERACTION). As we saw, what he wrote actually consists of two hidden transforms, the mass-to-ST transform and the ST-to-mass transform, in serial order. The vacuum/spacetime is just a big old scalar potential (an active virtual particle flux, and a very intense one). It is comprised of longitudinal EM wave pairs, by Whittaker 1903. By Whittaker 1904, those vacuum perturbations (spacetime perturbations) are just two potential functions – each of which is just LW functions. So the entire thing in the vacuum is just a bundle of LW functions. Now here’s the giant leap in physics, a real revolution! We always told you that scalar waves were electrogravitational. And so they are. Look at the two “hidden transforms” that are really involved. Well, they are nothing but just Wheeler’s general relativity principle! In short, “mass interacts upon spacetime to curve it, and curved spacetime interacts back upon mass to move it or form forces. So INFOLDED INSIDE MAXWELLIAN ELECTRODYNAMICS HAS ALWAYS BEEN FULL GENERAL RELATIVITY! But a really marvelous GR. Between two electrons, the E-force is on the order of 1042 times as strong as the weak G-force. So since the EM force is used in this case as the agent of ST curvature, this is a far, far more powerful GR force and ST curvature than is made by the weak little G-force that the astrophysicists mostly track, and have to go to the stars, lots of cumulated mass, etc. in order to get enough ST curvature to measure. For that reason, gravitation has remained a non-laboratory science. By making the proper assembly of LWs, we can alter spacetime directly, and powerfully, because we are using a far, far larger ST curvature force than the physicists now ordinarily use. And we can engineer it on the bench, or in devices. Think of any effect on matter that you desire. Anything at all. In GR terms, that effect requires the formation of “vacuum engines” or “spacetime engines”, -- i.e., inter-nested clusters of ST curvature. Those vacuum engines/spacetime engines are precisely what can be built by assembling and using longitudinal EM waves. I’m in process of filing a long tech paper to the U.S. patent office, followed by several patent applications. Want to transmute elements? Just flip one quark in one nucleon, and bingo! You have an isomer (either one element up the chain, or down it). You can make multiple jumps, etc. In cold fusion, e.g., what is REALLY going on is the inadvertent formation of such ST engines. Now time waves are not shieldable by Faraday cages. So they go right through the electron shells, into the atomic nuclei. Get the picture? Now you can put specialized EM-GR fingers right down into the nucleons, etc. Since there are lots of H ions, H3O ions, etc. in a liquid, the possibilities for “nuclear engineering” with determinism rather than staid old random statistics, is breathtaking. Those fellows are getting lots of new nuclides, without yet controlling the basic action, which is electro-nuclear, but in the new sense I just described. So, if you’ll just substitute the more modern term “longitudinal EM wave” for the term “scalar wave”, and realize that you are in an engineerable electro-gravitational theory, you will have it in a nutshell.